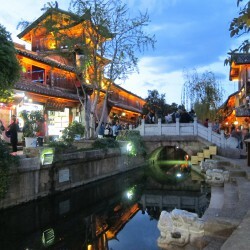 We spent most of the day in Guilin to get provisions for the long train ride. Mostly instant noodles and Chinese bread, for which we found a fantastic bakery – so good that we want to come back to eat their bread again. 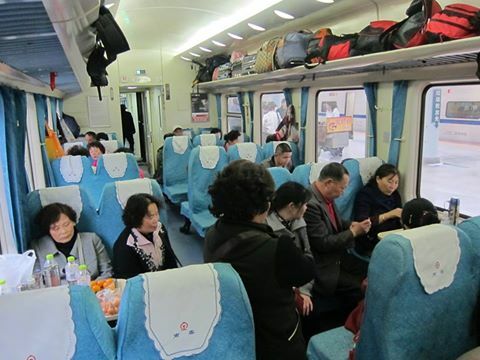 Boarding a train in China is more like in an airport elsewhere – you go through two security checks, find your gate and show your ticket when it’s boarding time, when you can finally go to the platform. All this takes time, which kind of defeats the advantage over a flight a little bit. 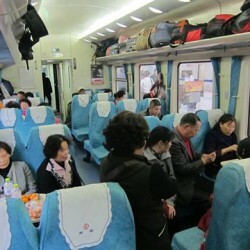 The train was modern and clean, but the seats crammed. It was nearly full and we hoped some passengers would exit before the night so we could spread out to sleep. It was great fun for a while as we witnessed the other passengers gamble and enjoyed the endless karst scenery out of the window. 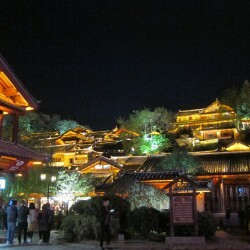 As night came, we rolled into Nanning, where indeed most passengers exited. We managed to find some empty benches to lie down on. 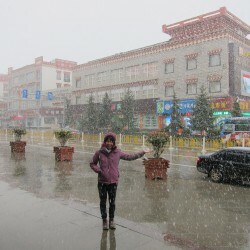 We rolled into Kunming after 12 pm the next day. 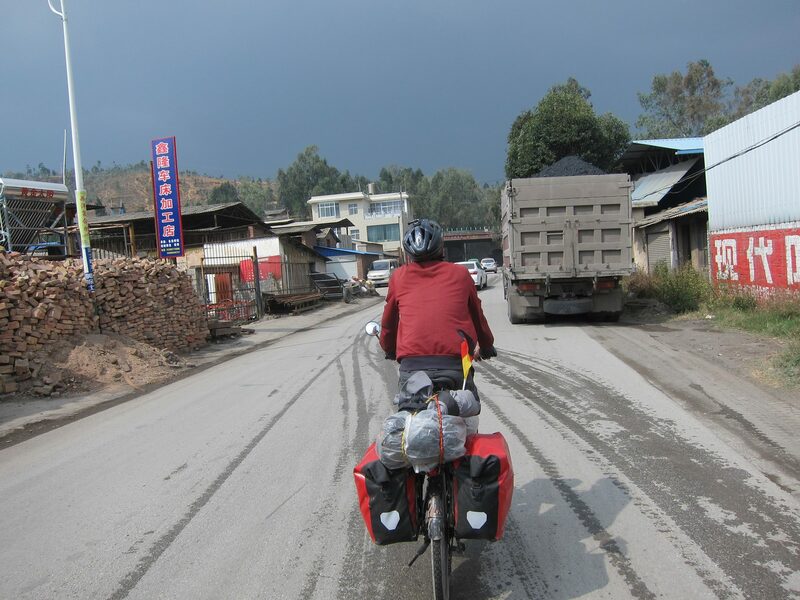 After exiting the station and finding the freight office, thanks to Yuily being able to locate it on Baidu Maps, we found that our bicycles arrived as well just before. It’s highly likely that they were in a freight car attached to the same train. I set up a Warmshowers host earlier and we rode to his place through the city. 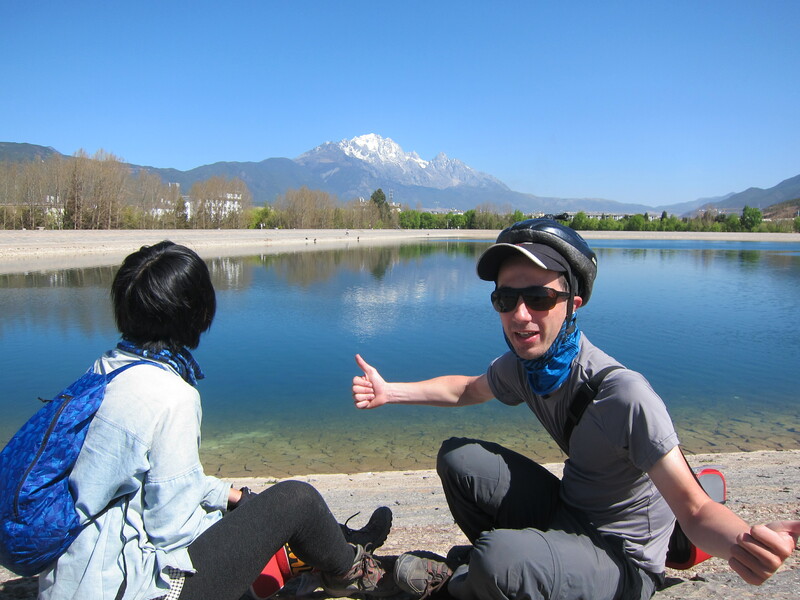 Kunming’s climate was an awesome change: It was sunny and dry with a low humidity and perfect 25°C. 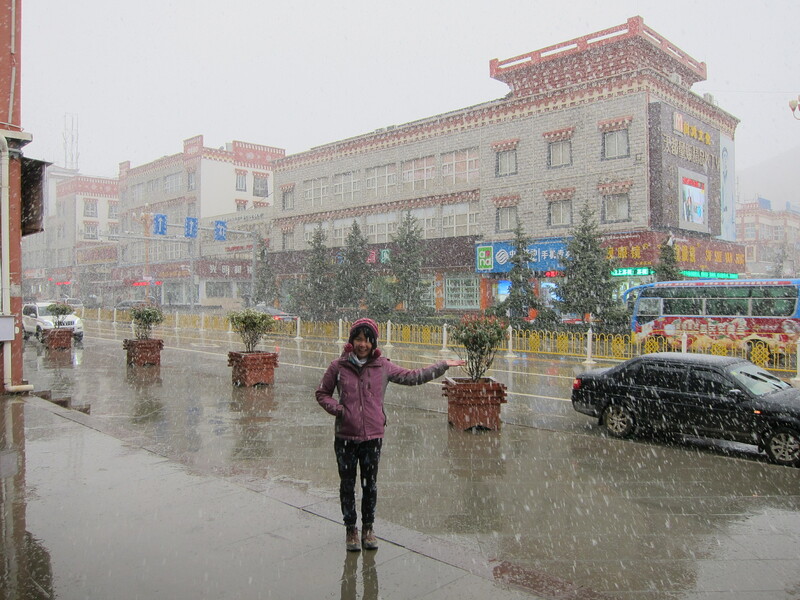 This is what I was looking forward to in Yunnan! We arrived at our host Huis place, a bicycle shop called Pegasus. 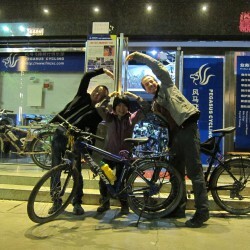 In there he already hosted hundreds of bicycle tourers before, with Kunming being a crossroad for many of them. We were made to feel at home and he invited us to his family dinner as well. We started to really love Warmshowers! 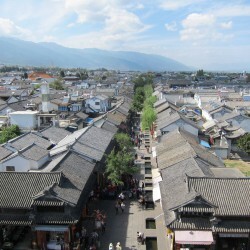 Our next point of interest from here was the old town of Dali, roughly 400 km west. Getting going early didn’t really work as it was 10 am yet again as we headed out. At least here we had longer days, as due to whole China running on Beijing time, the sun didn’t set until 7:30 pm. 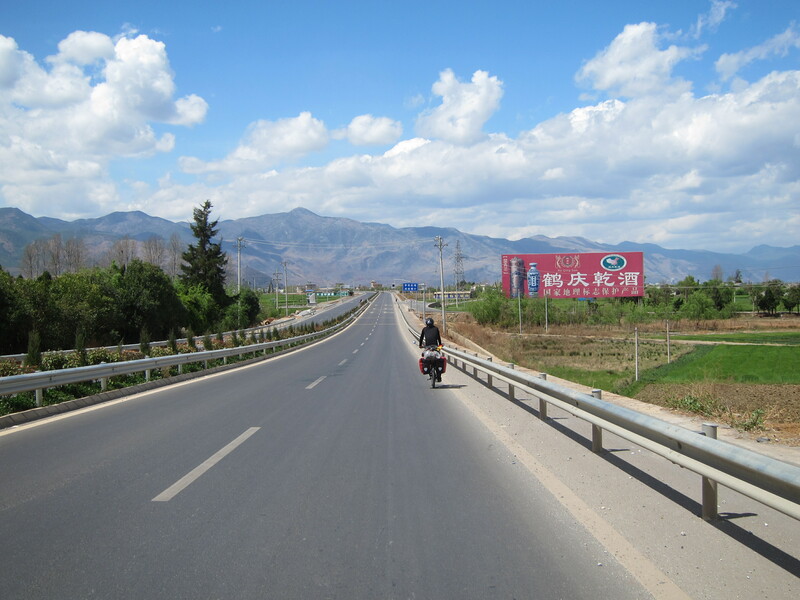 Heading out of Kunming into Anning, we had good speeds until the road deteriorated to being bumpy and single lane. Several trucks were still using it and occasionally covered us in their fumes (but gave us space!). After some downhills we passed the 100 km barrier. Just after I noticed my rear tire slowly getting flat, so it was a good time to look for a camping spot. We set ourselves the goal not to pay for accommodation until Dali. Thanks to the loud trains we woke up after sunrise yet again and it was past 9 as we got going. My flat from the previous day seemed to be a really slow one, so I just pumped it to see how long it would hold. 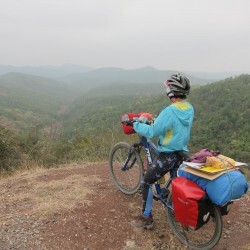 The road followed a narrow river valley for the first 25 km, and with no shops in there, our breakfast consisted of biscuits. Unfortunately my tire lost too much pressure too fast, so I relented to change the tube. There were numerous blockages on the way, so by the time we were out of the valley it looked unlikely that we would get very far today. 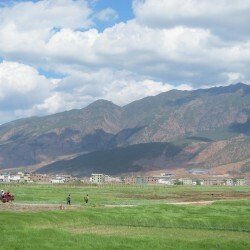 We came into Chuxiong later and due to the city the road was widening and not bumpy for once! 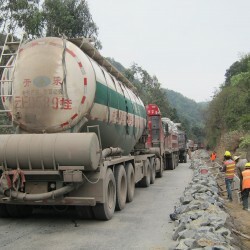 Sadly, just as we got out, it changed back again, and not just that: Roadworks were underway. The apocalyptic kind where all that’s left of the road is a sandy, muddy lane. 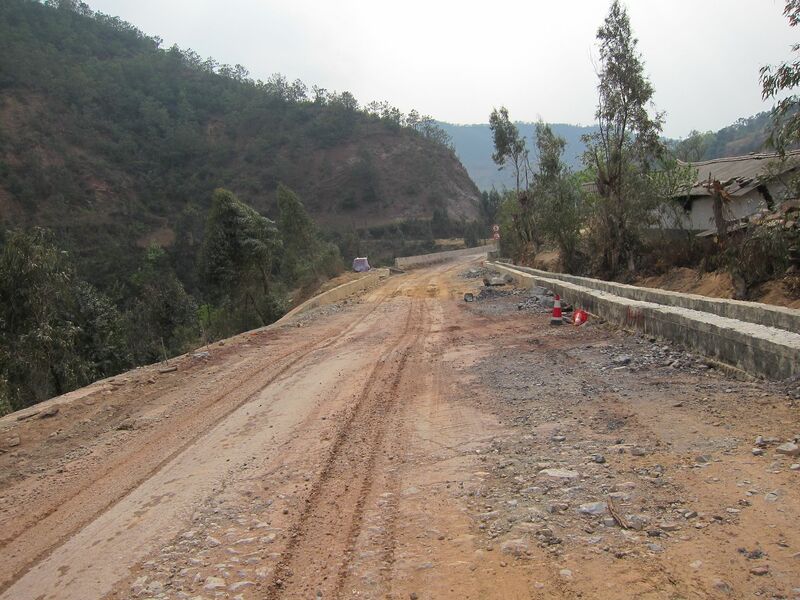 We were in good spirits to make another huge step today, but were greeted by yet more patches of roadworks. 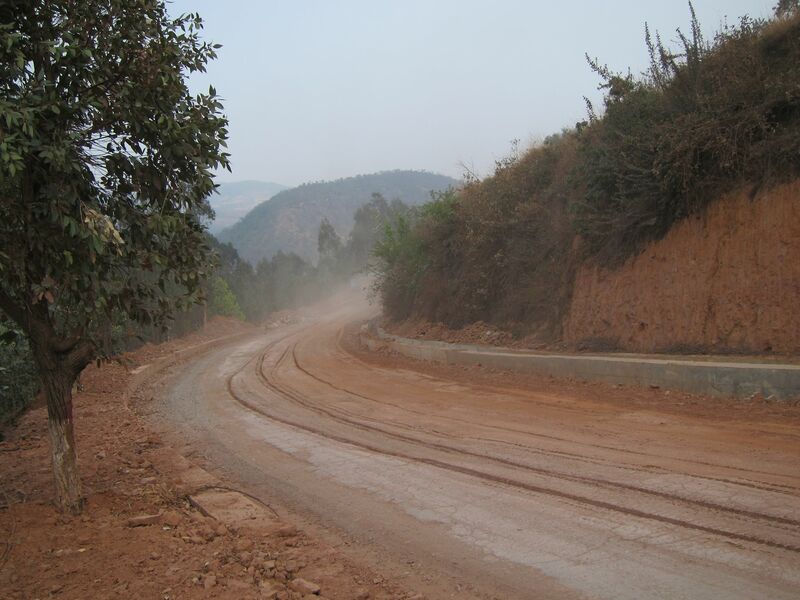 It seemed they were completely rebuilding the road, and where ever the old road crossed the groundwork for the new one, it was reduced to a sandy, dusty mess. Things didn’t get much easier as we soon reached a huge climb. 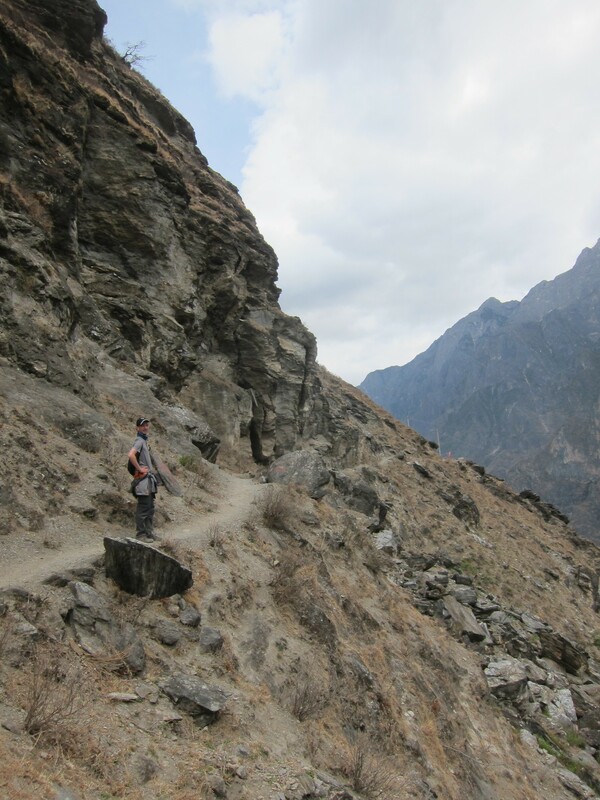 We slowly made our way up over several false summits – we felt like ants climbing up stairs. Each time we thought we reached the top, there was another climb behind it. When we finally reached the summit after 20 km of climbing, we got excited for the downhill. 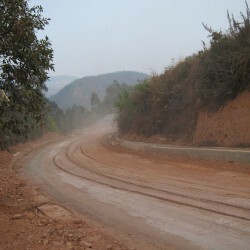 However, soon the road turned to dust as roadworks were underway. 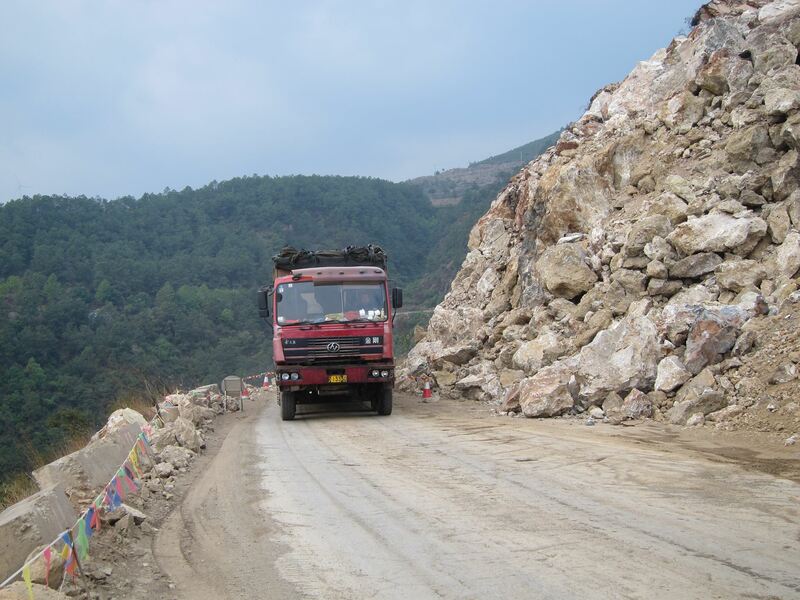 The rubble was shaking our bikes as we kept dodging trucks, who turned the road to mud by spraying water on their brakes to cool them. All this made the downhill slow and not fun at all. Below the dirt, I could make out the old road, which quite often was uneven rocks held together by a bit of tarmac. 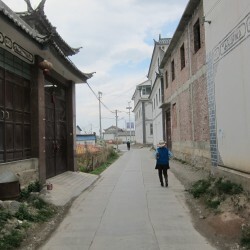 Like cobblestone, but worse – possibly still from Mao’s times. A good reason for rebuilding it. 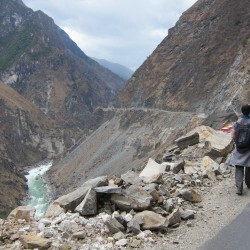 But this is a national highway! It should’ve happened way sooner! This is something other tourists have reported as well; all the national government seems to be concerned about is “Moar Expressways!! !” as they have built the worlds most expansive expressway system in the last 20 years. But the old roads received little to no care in this time, and people who don’t have cars or can’t afford the expressway toll are stuck with them. 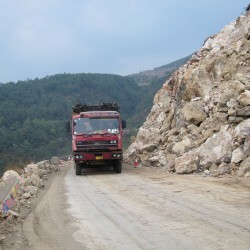 All the while toll-dodging trucks destroy the roads further. 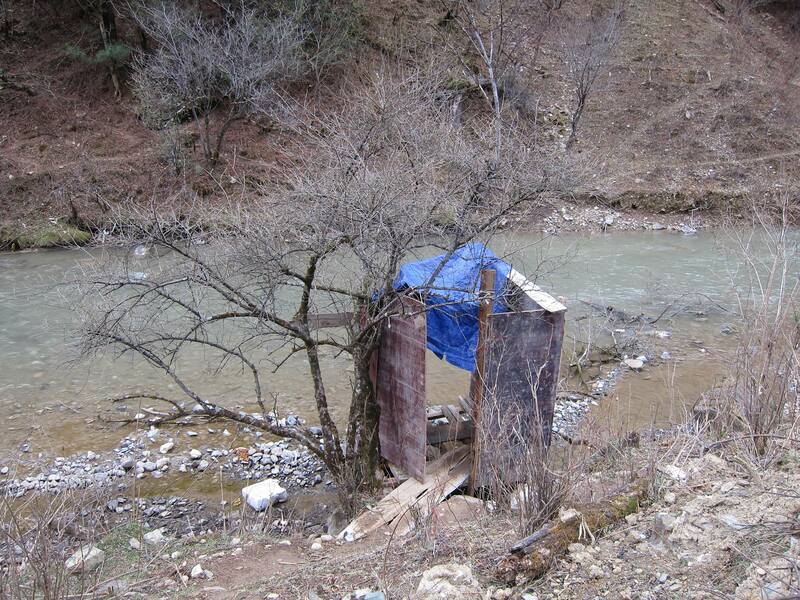 A fine example of the divide between rich and poor in China. 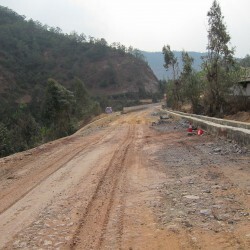 The roadworks didn’t end as we reached the base of the descend and continued over the rolling hills that followed. We were well short of 100 km and wouldn’t make them before dark. Yuily was exhausted, me too, but if we couldn’t make 100, I wanted to do at least 90. 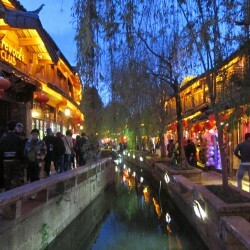 Another problem was that the area was devoid of any shops, and with our water low we didn’t have enough to cook tonight. Fearing biscuits for dinner, I shamelessly popped into a trucker motel and filled a bottle from their rainwater tank. Maybe not safe to drink, but it would do for cooking. 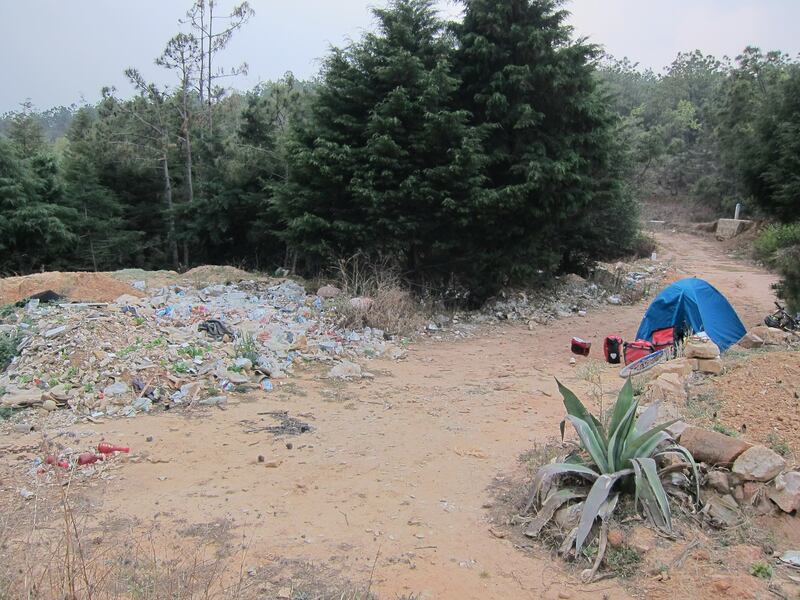 At 93 km we found a farming track that lead to a footpath and was used as a rubbish dump. We set up our tent in an area free of rubbish – not all wild camps are pretty – at least we had a nice view over a valley. Yuily was wondering why I was so determined to make 90 km today. 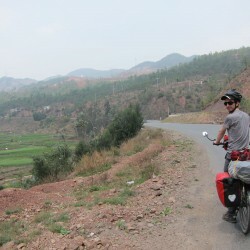 Well, now we had about 125 km to go to Dali, and with that a bed and shower. 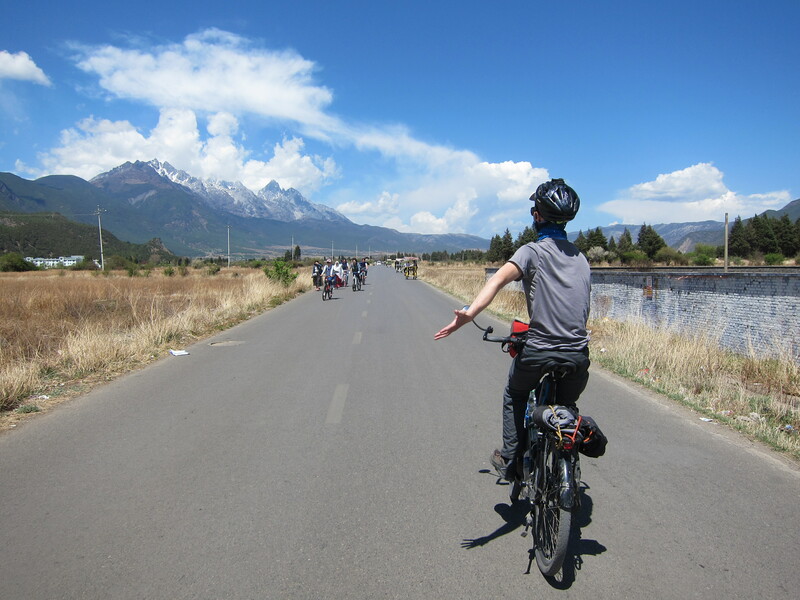 Each km that we didn’t cycle today would make it harder to reach Dali tomorrow. 125 was probably the limit of what we could do in a day on this terrain right now and by doing 90 today I just about put us in reaching distance. 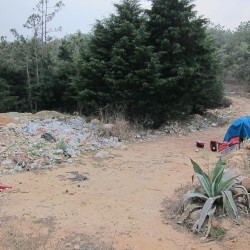 Camping at an old rubbish dump. We actually managed to wake up and pack with daybreak this time. The sky was full of dark clouds and we noticed a few raindrops – this wasn’t good, in rain these roadworks would be pure hell! On that note, accuweather can burn there as it forecasted a very sunny day. Thankfully it never rained enough to make anything wet as the roadworks continued forever. Some patches were ok but overall we always had to expect a gravel pit around the next corner. One section even had a warning sign to choose alternative routes, but ironically the road was in its best condition there! 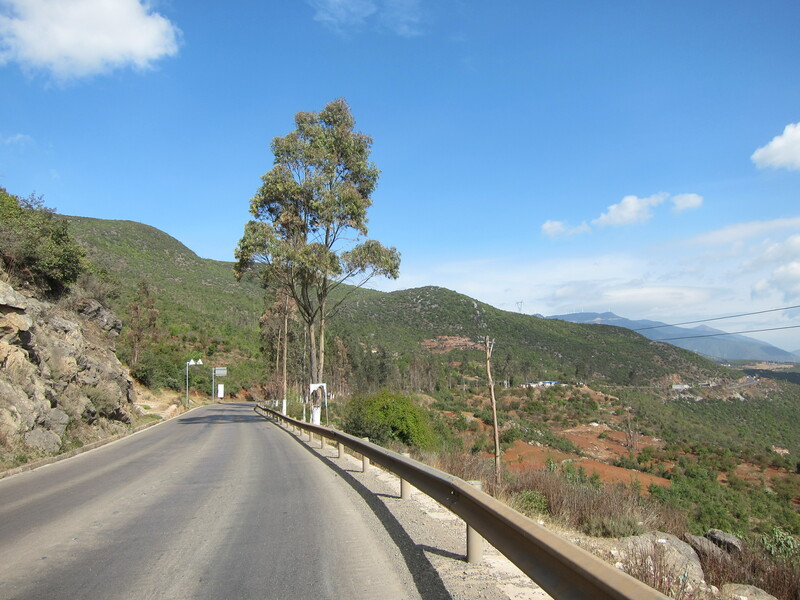 We descended most of the way until we saw the road starting to snake up a big mountain pass. Our by now trained legs made short work of it as we enjoyed the scenery and did our best to ignore the trucks and roadworks. Down from the pass, where our bikes became muddy again thanks to trucks wetting the road with their brake-cooling water, I knew the road would improve as we reached the outskirts of Xiaguan, a big city. We just flew along at great speeds with tailwind. 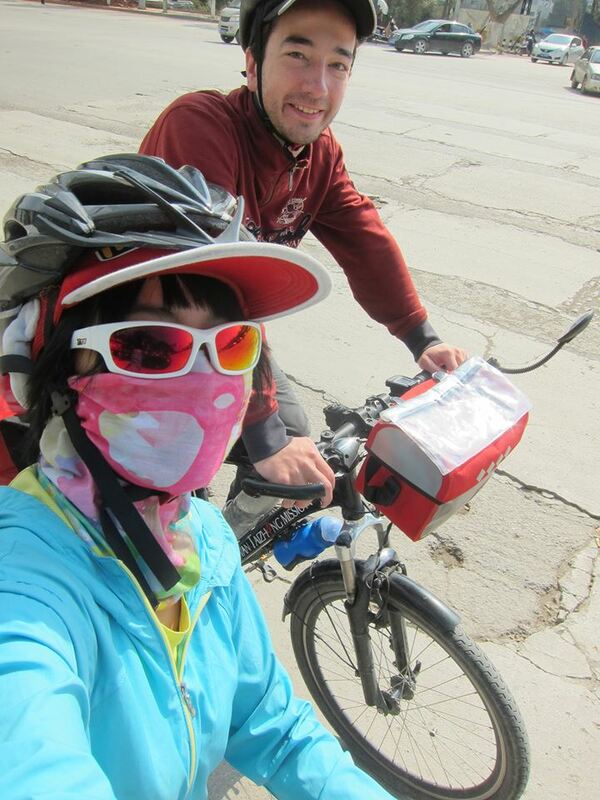 Unfortunately it turned into a headwind as we got downtown which had us fighting. The roads also lacked bike lanes and were a chaos in rush hour. To top it all off, there was a thunderstorm coming in, soaking us. 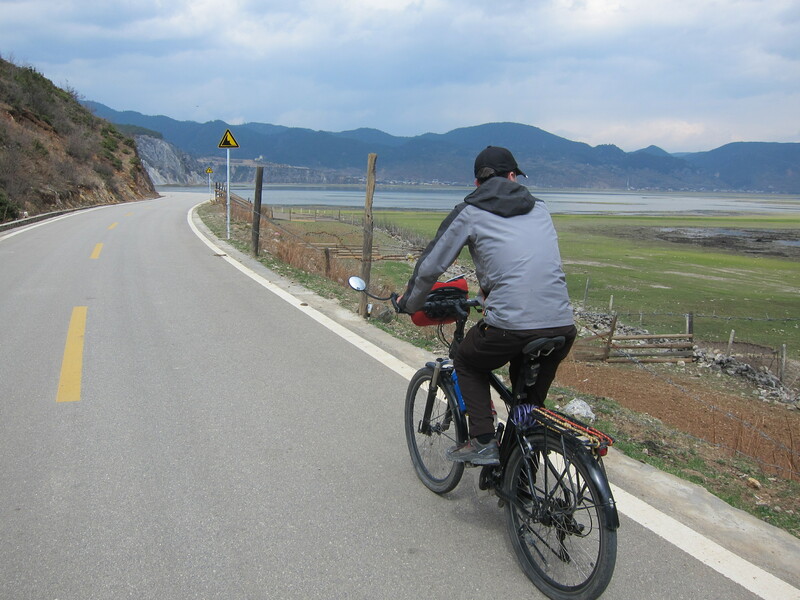 But we were just 15 km from Dali, there was no stopping! 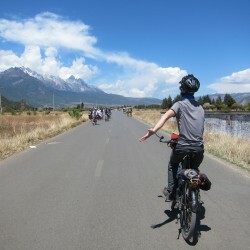 After dinner we cycled the last bit in the dark, this time on a cycle lane running between Xiaguan and Dali. We were exhausted and mad at the rain when we reached the hostel. 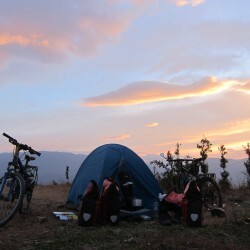 Thankfully, it’s one of the best hostels ever – “Color of Wind” was founded by a fellow cyclist who knew everything a traveler needs and we were welcomed in a beautifully crafted building, ready to have a rest day and a much longed for shower. 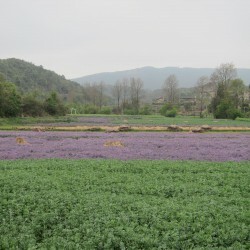 Overall, I would recommend taking the train between Kunming and Dali. The roads are just too bad and there is not much good scenery. 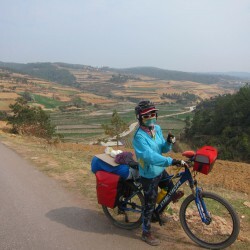 The main advantage it had for us is the massive leg muscle boost from doing 430 km in 4 days. 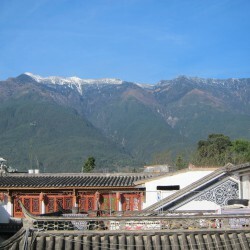 Overnight snow has fallen on the mountains around Dali which made a very nice backdrop. In the daylight we also saw what kind of pretty hostel we chose! 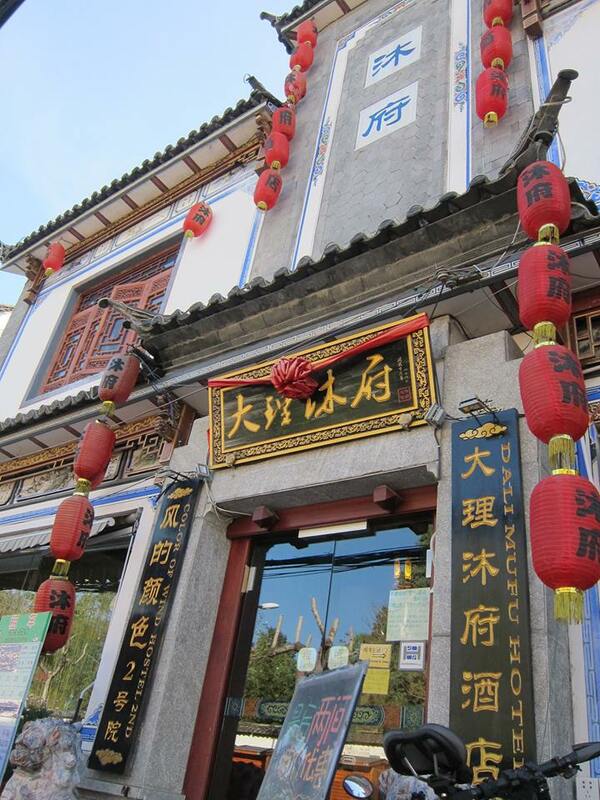 It was a building completely in Chinese architecture with a love for detail. After doing breakfast and laundry (RMB5!) we went to clean our bikes a little bit. I worringly noticed my rear wheel being loose – had I worn out the rear hub already? This needed attention from a professional. After riding around town to track down a bicycle mechanic, we found a small shop with an old man and several tools and parts. After showing him the problem, he immediately took off the wheel, adjusted the nuts and poured oil into the hub. Everything went really fast, but he certainly knew what he was doing as 5 minutes later everything worked perfectly! He wanted no more than RMB5 for his work – what a legend. 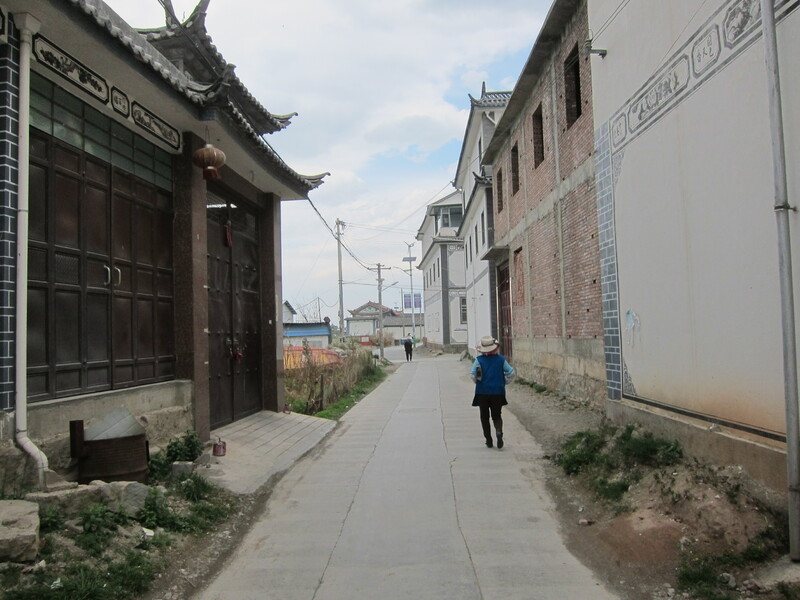 We set off to explore the “old town” – almost nothing here is really old. 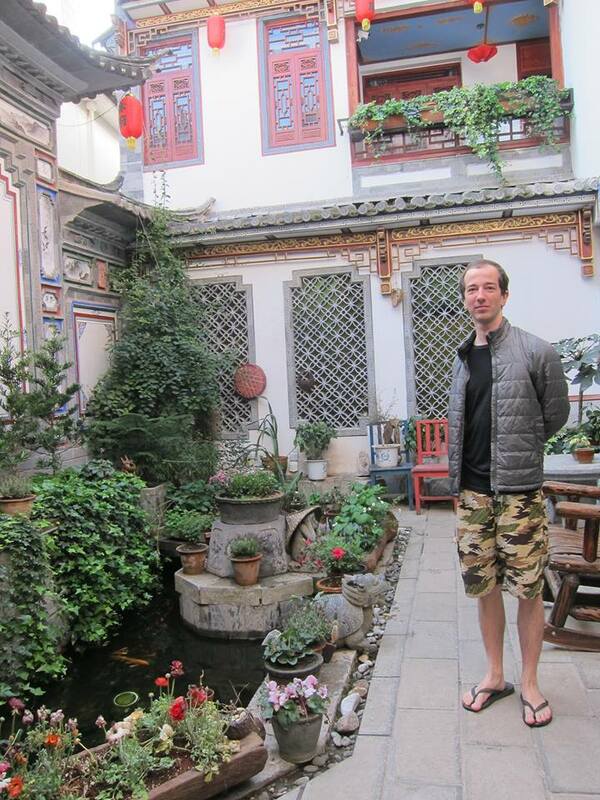 It was still fantastic – the architecture is simply beautiful and this was the first place we’ve seen where the Chinese really cherish their style instead of opting for modern but soulless commieblocks. Later we went out with our dormmates for expensive but very good food and craft beer. 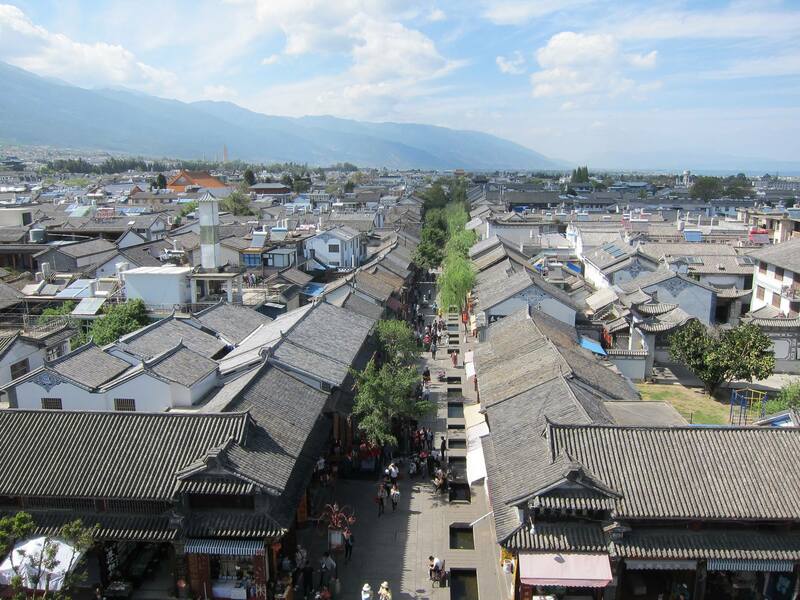 We heard of Dali being regarded as a tourist trap, but while there are a lot of tourists, it didn’t feel like that to us one bit. 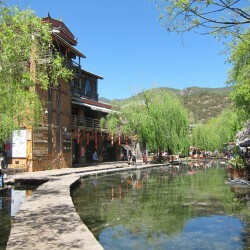 We absolutely loved it here and highly recommend it! 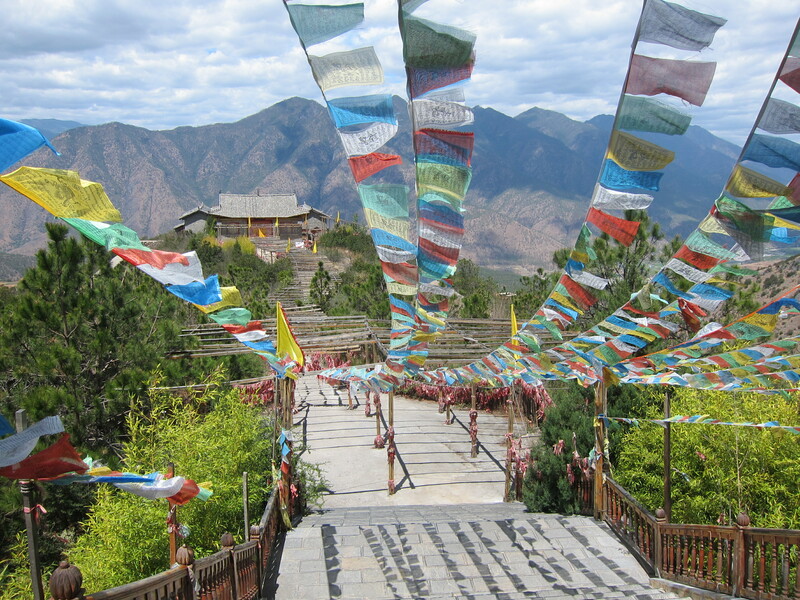 Although we loved it here, visa limits and several more things to see on the Yunnan tourist trail meant we better move on. But still, we took our time as we chatted away with other hostel guests and later the manager about his and our cycling trip. Heimat was really friendly and even treated us lunch from his restaurant, which tasted fantastic! 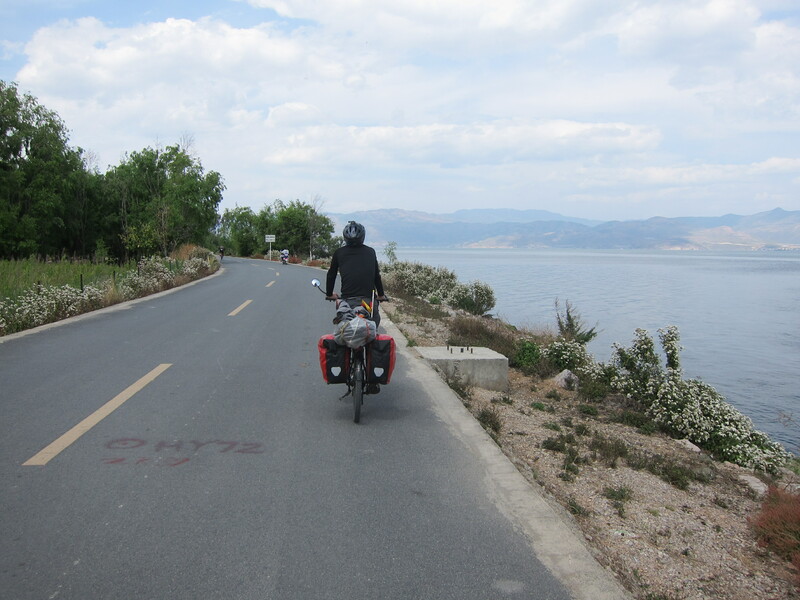 After we left the old town, we cycled along the lake. The main highway was too far from the shore so we took a longer but much more scenic route along the shore. 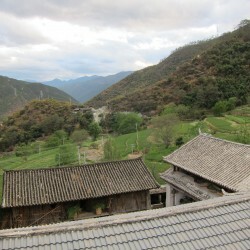 It let through numerous small villages that were filled with guesthouses but also regular farms. The architecture was the same beautiful one as in Dali and there were loads of other tourists on rented bicycles and electric scooters. We also witnessed two wedding shootings! 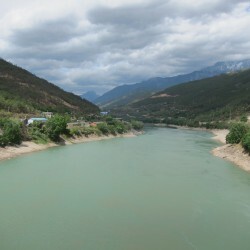 This was really a spot where the Chinese themselves spend their holidays. 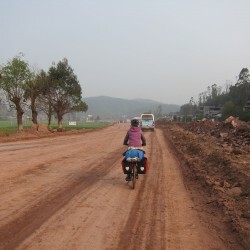 As we left the lake area we were back to the usual Chinese roads. We were climbing and soon after it was late so we looked for a spot to camp. 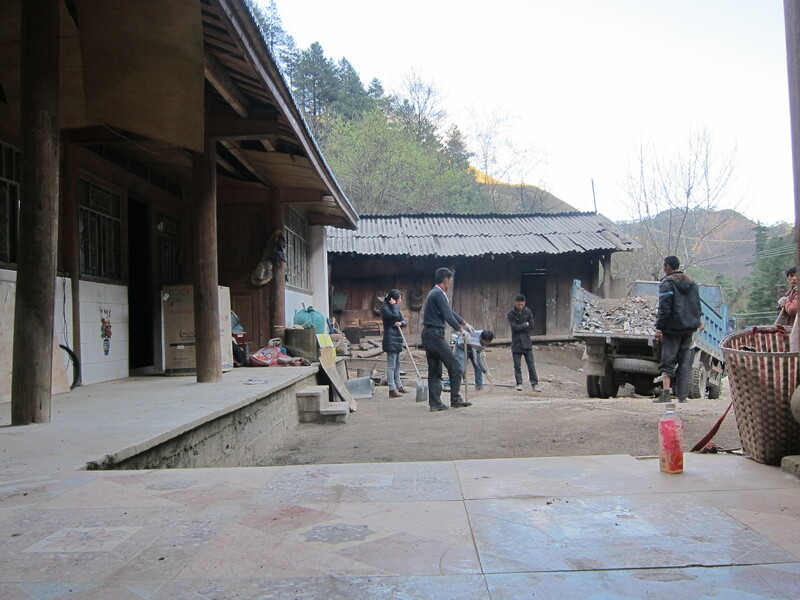 Luckily cultivation was on a low here as we easily found a flat space on a hilltop. 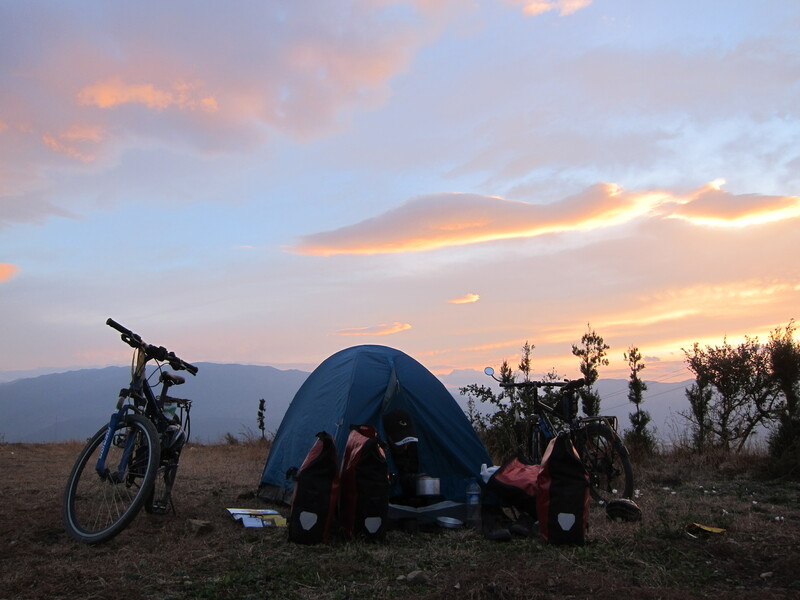 It was a beautiful sunrise from the hilltop and we said to ourselves that we would try to make it to Lijiang, even though it would be yet another 120+ km day. We made quick work of the remaining hill and went through the up and down that followed. 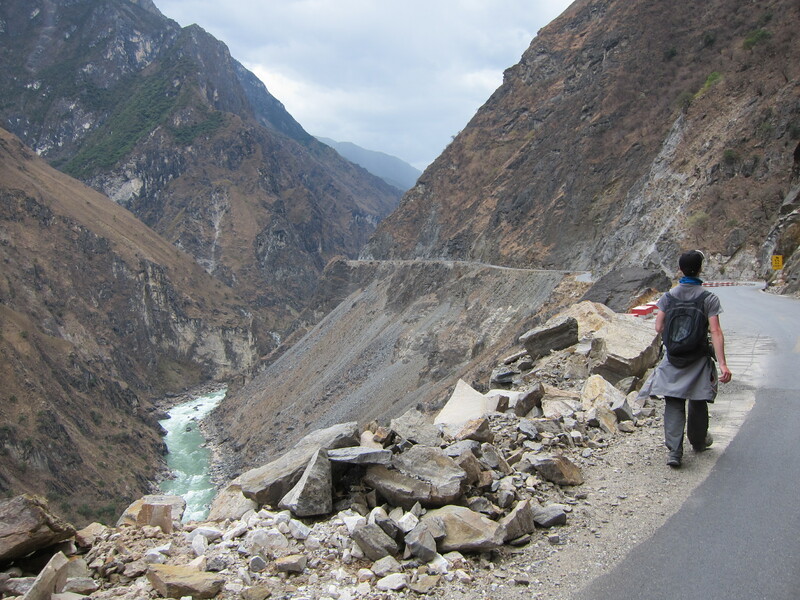 Food was sacre along this stretch of highway so we consumed a pack of biscuits slowly. When we finally found a town it was already lunch time. Luckily for us some truckers left half of their food untouched and the waitress told us we can have it. More up and down followed as the sun got really really intense. I didn’t think we would feel this kind of heat in China! 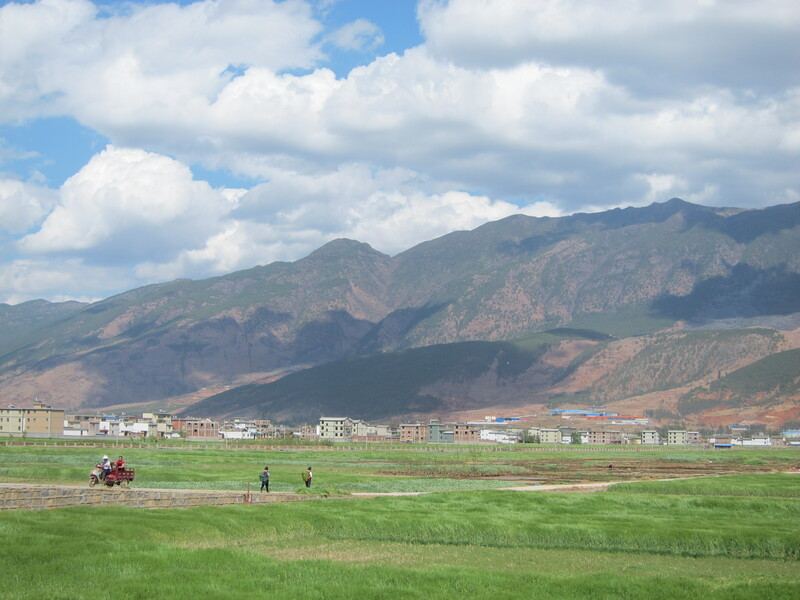 The scenery was really good – kind of what I hoped for in Yunnan. During cycling I also started learning some Russian with audiobooks. 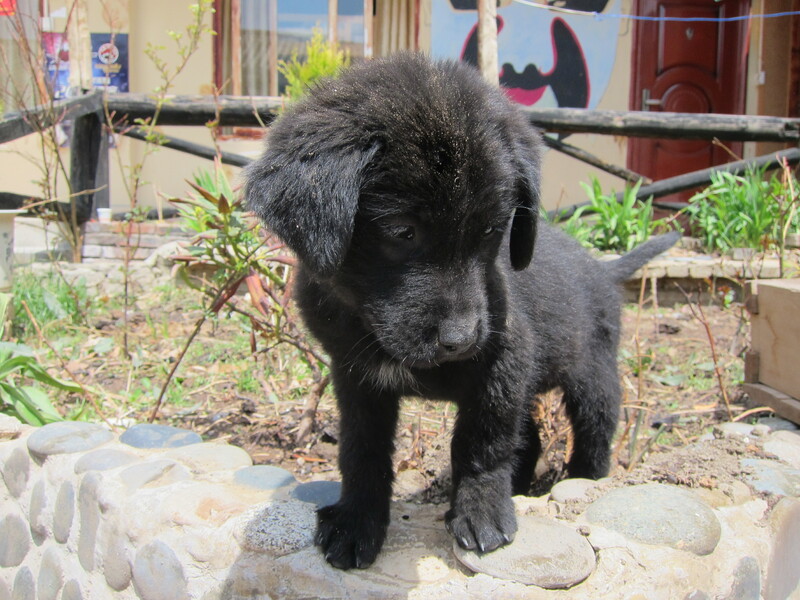 It might get useful once we get to Central Asia. 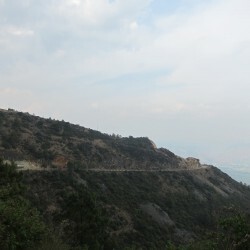 After the last climb, the road actually got 4 lanes with a wide shoulder, similar to an expressway. We were able to make excellent progress on it as it flowed into a valley and we got some tailwind. Water soon became a sacrity and just like a few days earlier I popped into a restaurant to ask to refill some. No problem. 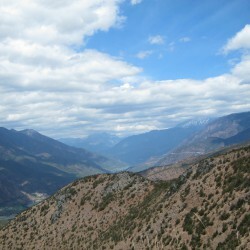 We soon climbed the last bit out of the valley and got to see Jade Dragon Snow Mountain ahead of us. Its 5600+ m peak was in clouds but we could still easily see lots of snow and how enormous the thing is. 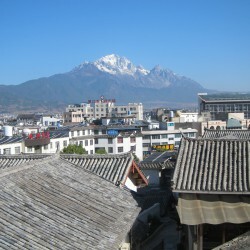 This also meant we were close to Lijiang, were we arrived an hour later. A hostel I picked here turned out to be very disorganized. Their English was pretty bad so Yuily had to do most of the talking. 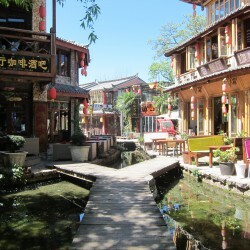 They didn’t give us the price listed on hostelworld, RMB15, and insisted that we had to book it there if we wanted that price, otherwise it would be RMB25. Ok, so I went to book it. It took a while of frustrating attempts because of slow WiFi, but I eventually managed it. Next, they said one of the beds we just booked isn’t available, so we’d be in different dorms for one night. Hargh. When I went to my dorm, all of the beds were taken anyway. I asked the receptionist, and she pointed to a bed I could use. Fair enough, I removed the bedsheets myself and put my fresh ones on. Several hours later, another guest was surprised that I had taken his bed! The receptionist moved him to another bed then, luckily, for me, he was fine with it. We are staying three nights in this place. Let’s see what other surprises await us! 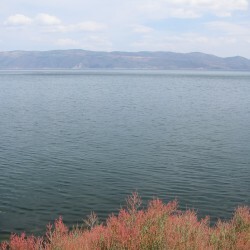 sceneries like from a painting. The first of our two days off here was spent doing not much at all. Yuily was reading books while I watched videos on the internet. 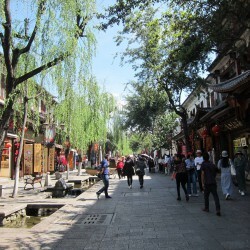 While the old town was adjacent to the hostel, we heard the entrance fee was RMB80 per person, a bit steep for our budget. Luckily we also heard that it’s free after 7 pm. So we did visit that evening. It was a very touristy place, but fantastic. To compare, I never knew why tourists from Asia are so amazed when they see European old towns. Now I knew. Just like Dali, nothing was really old, but crafted in such a beautiful way to just admire. The next day we did more of the same. 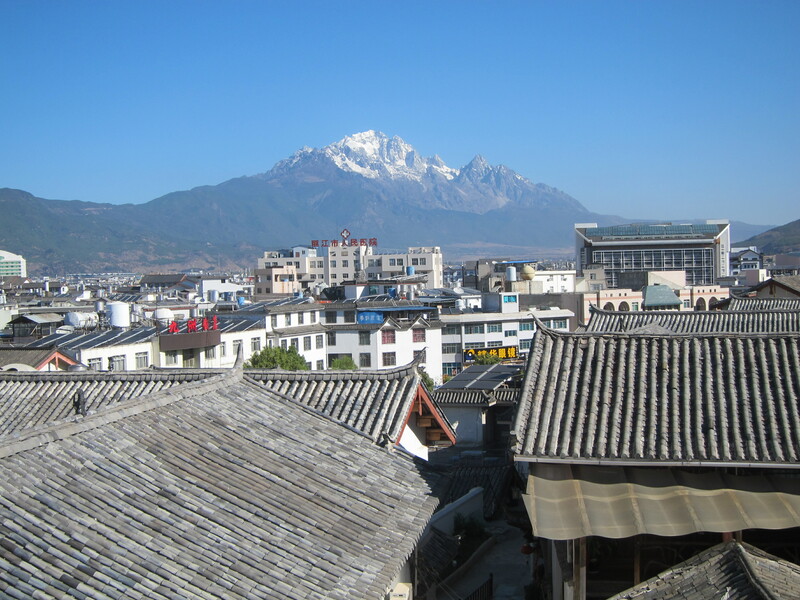 The weather in the morning was brilliant as we could get a great view of Jade Dragon Snow Mountain, the 5600m high monstrosity covering over the city. 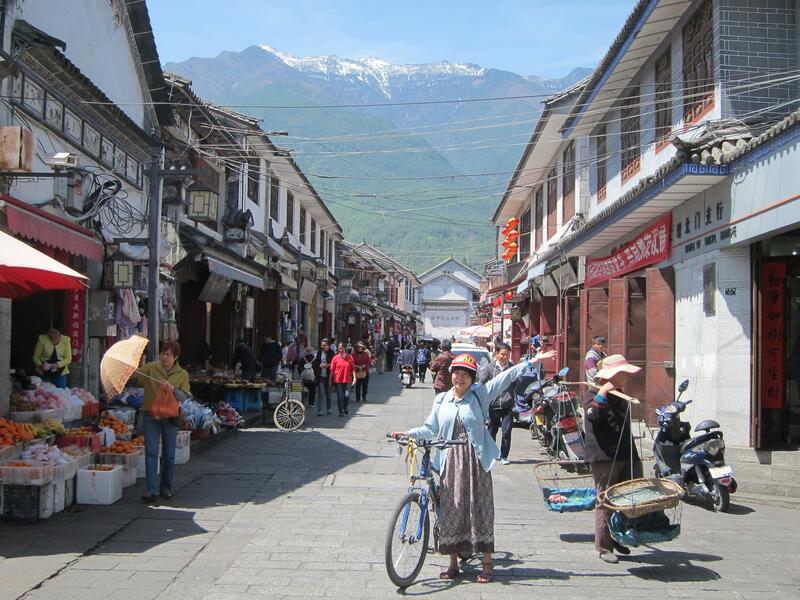 There were a few more old towns scattered around the Lijiang area which are easily reachable by bicycle. 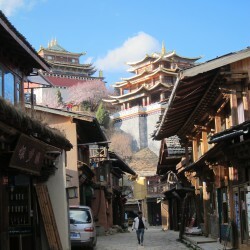 First was Shuhe, which had a couple of rivers and lakes intersecting the buildings. 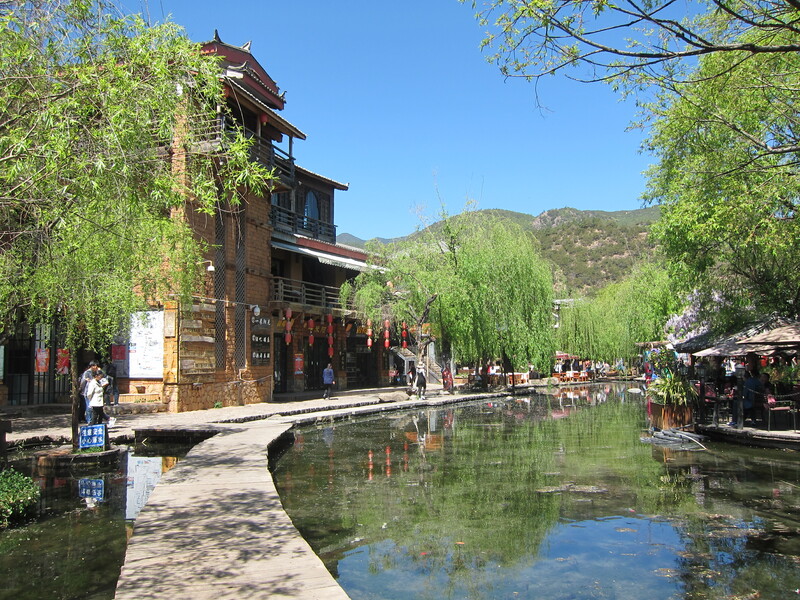 Less crowded than Lijiang but almost as huge, it had some very tranquil areas. Wedding couples also appreciated this as we literally saw dozens of them and had to watch out not to step into their photos. 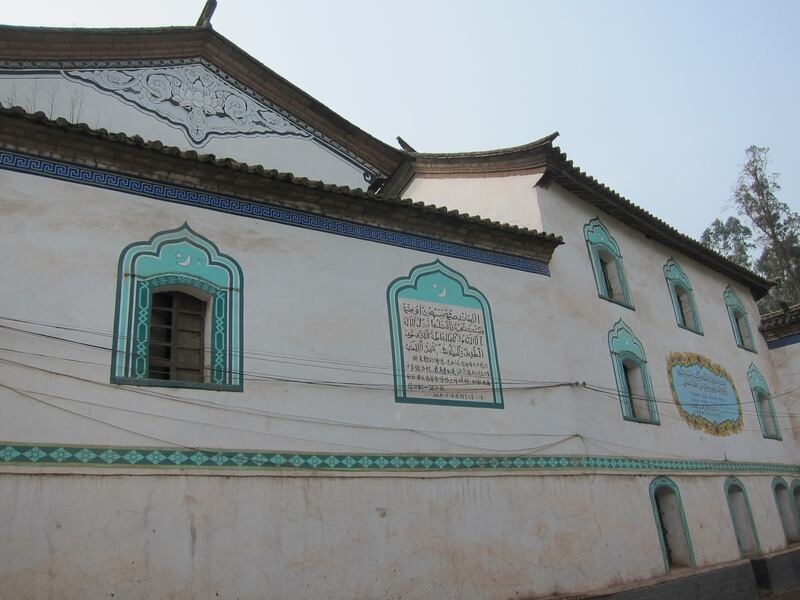 Baisha was a much smaller town, surprisingly having more western visitors. 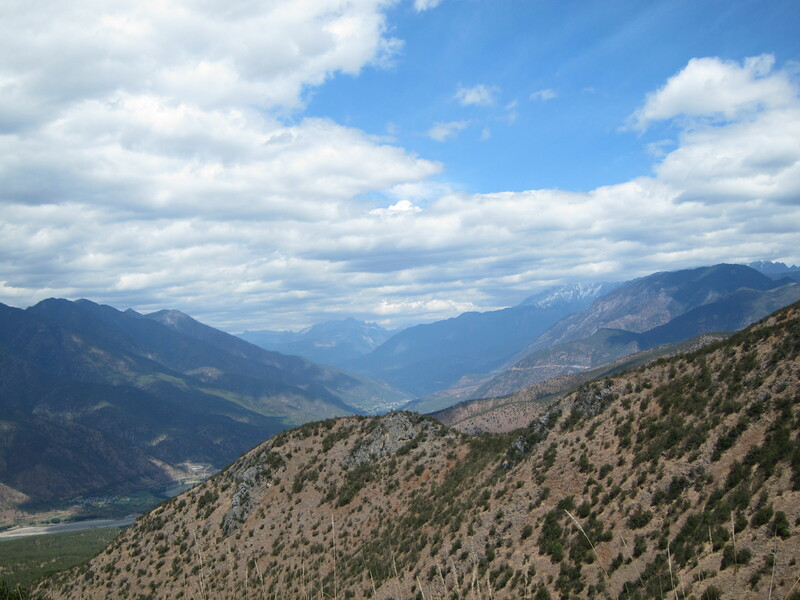 It was very close to Jade Dragon Snow Mountain, which unfortunately covered itself in clouds by now. With rain beginning to fall and not that much to see we retreated to our hostel after buying some additional brake pads for our bikes. 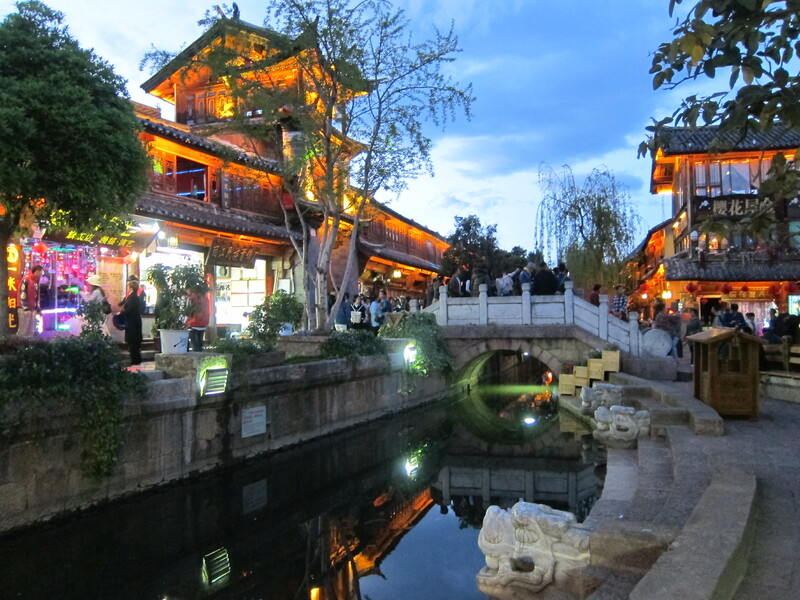 We thoroughly enjoyed Lijiang and, like Dali, can highly recommend it! 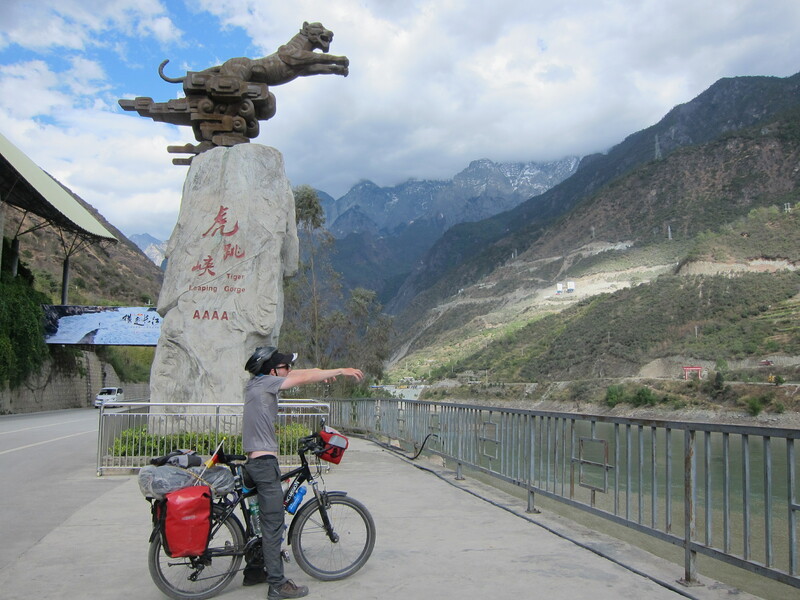 A big scenic spot further north of Lijiang on our way was the Tiger Leaping Gorge – a deep canyon carved by the mighty famous Yangtze river between Jade Dragon Snow Mountain and Mt. 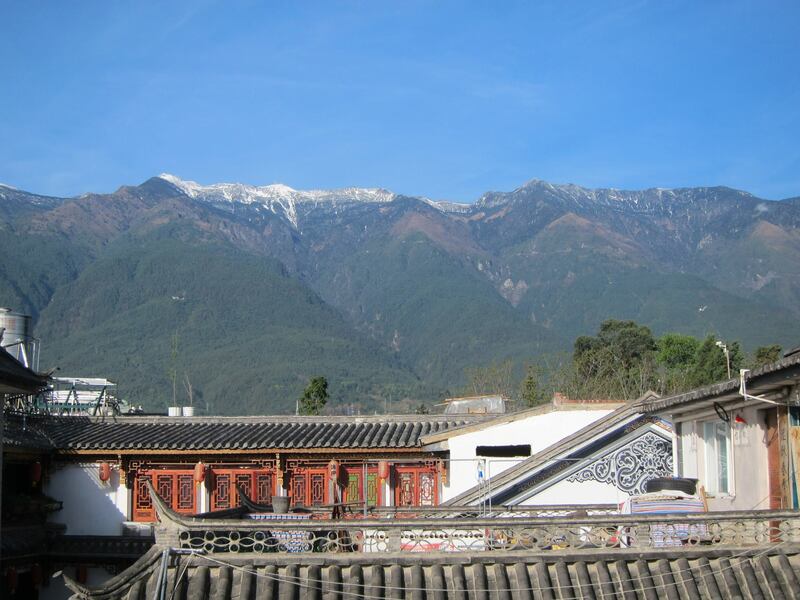 Badaxue, both well over 5000 m. One of the most scenic spots in China, we decided to cough up the RMB65 entrance fee to hike there for a day as we are nature lovers. 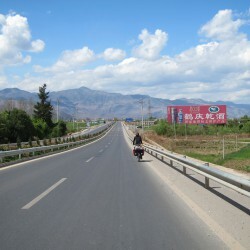 90 km lay between Lijiang and there, a perfect day distance. Next to our hostel was a nice lady selling pancakes out of her electronics repair shop in the mornings, which were so good that wolfing down two of them kept me fueled well into the afternoon. 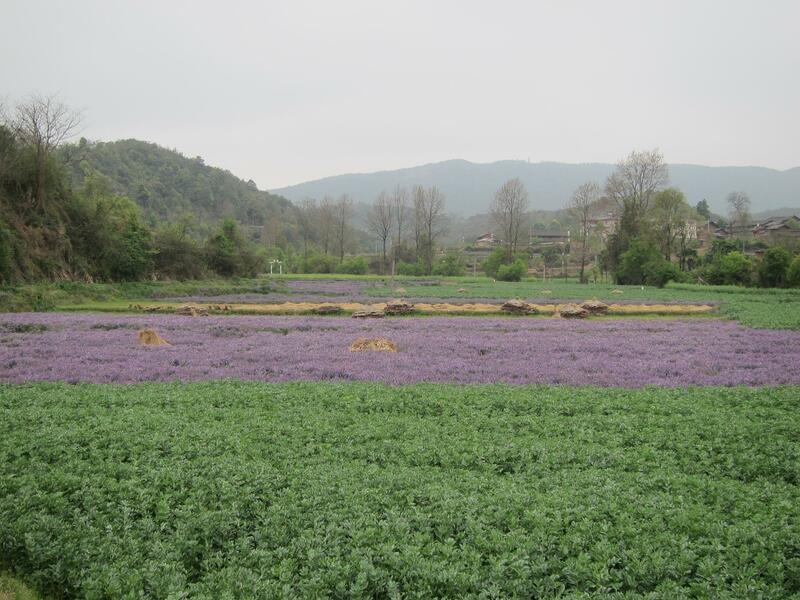 We climbed some hills out of the city and took in some sights on the way. 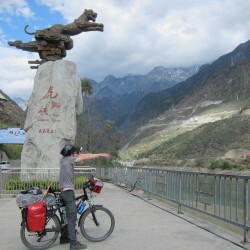 Soon after the road dropped us 600 m down into the Yangtze river valley with some spectacular sights. 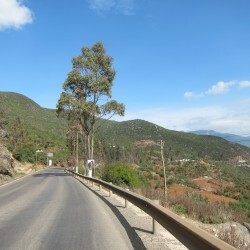 Much of the descend was freewheeling at 40 km/h without the need for brakes. We got to the entrance point of the Gorge and paid for our tickets. 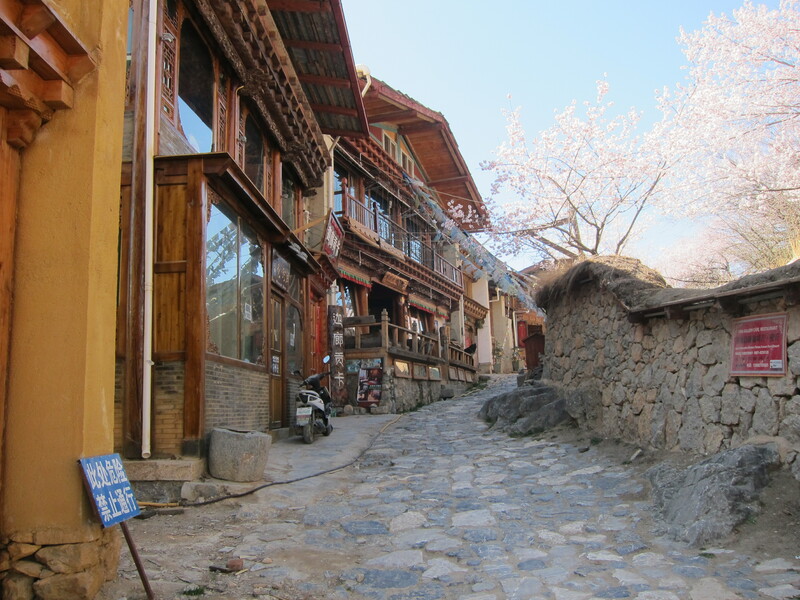 I found a nice and cheap guesthouse, Naxi Family Guesthouse, online which was 2 hours into the hiking trail. 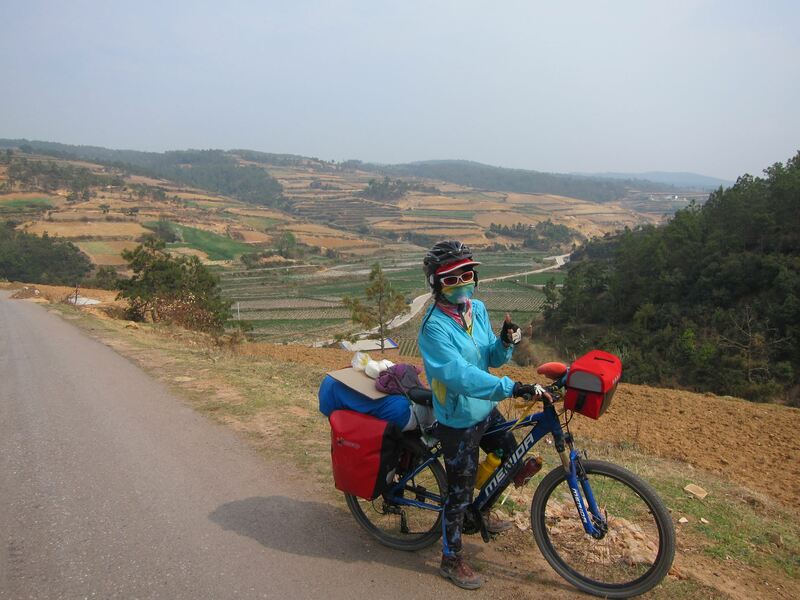 We asked if it was possible to bike there and indeed it was – following the highway through the canyon, there would be a steep paved track that ascends to it. Steep was no underestimation. Even though just 3 km, it took us 90 minutes, pushing most of the way and taking a break every few meters. When we arrived we were delighted though. 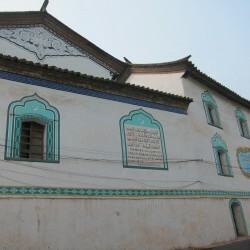 This was a place where the title “Guesthouse” was taken literally. A family farm with a few rooms for hikers, very cozy and natural. 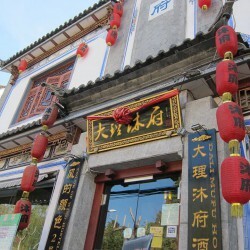 A twin room with shared bath set us back a reasonable RMB60. 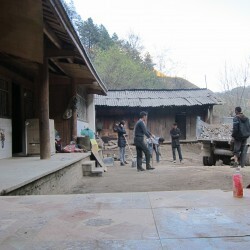 The other guests were mostly western – hiking doesn’t seem to be popular at all with Chinese tourists. 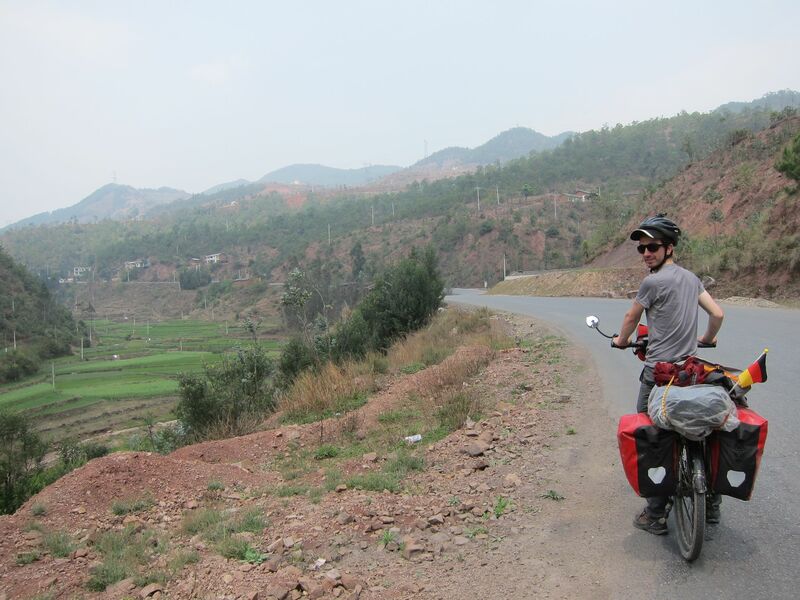 We left our bikes at the guesthouse for the day to tackle at least half of the hiking trail through the gorge. 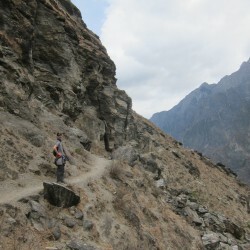 Soon after starting we were immediately surprised by the roughness of the trail. Even though it was a big tourist destination, there were no stairs or fences on a trail made up of dirt and stones with rudimentary arrows pointing the way. We could see big construction on the other side where new, easier hiking trails were constructed along with tunnels for an expressway and a train line. They didn’t really respect the serenity of nature here. We thought we were moving fast, but actually lagged behind the posted times on the map. 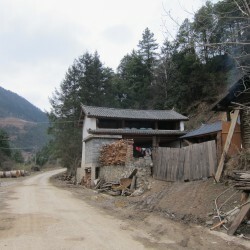 On the way were several villages, each with a few guesthouses and signage in English, suggesting that Chinese tourists were not the main audience on this trail. 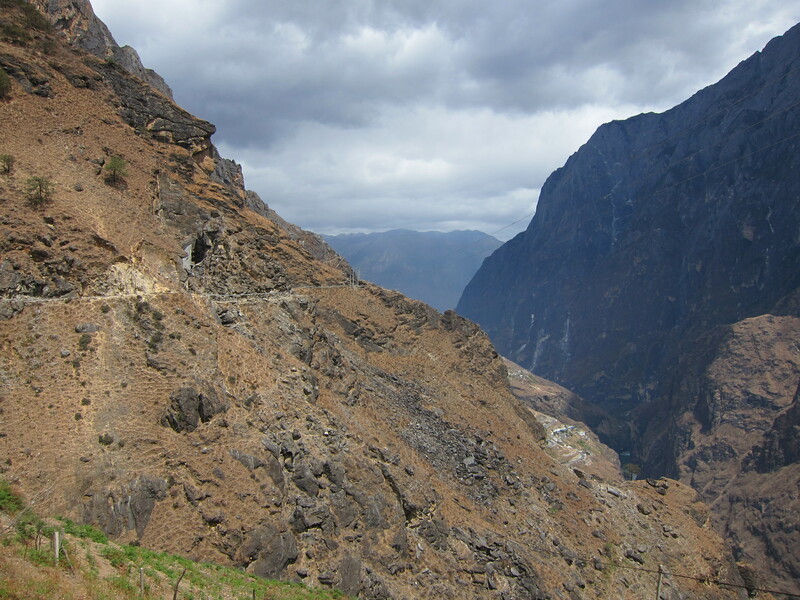 Actually, we didn’t really see many people at all and had big sections to ourselves – I didn’t imagine one of the most popular hikes in the world’s most populous country to be like this! 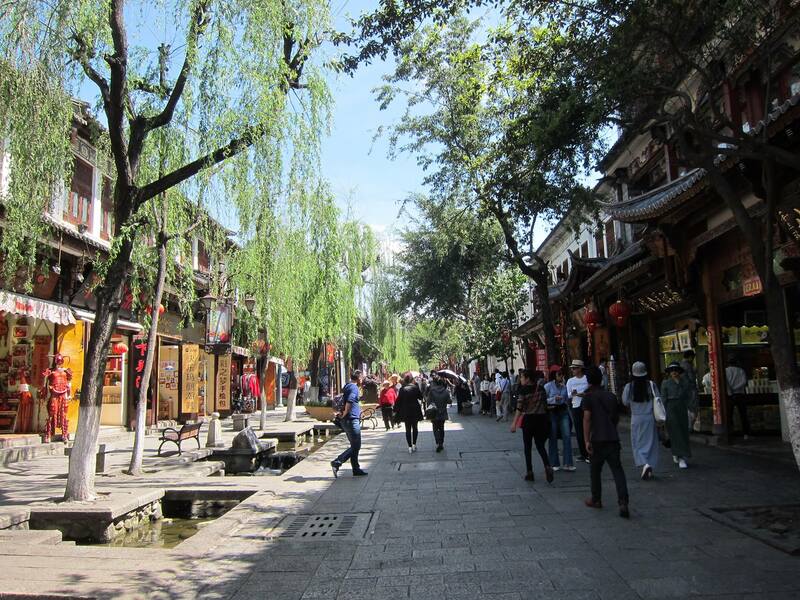 I only assume that the numbers of western tourists in China are rapidly declining because of stricter visa rules on one hand and negative press on the other. And the Chinese are simply not interested in hiking at all yet. 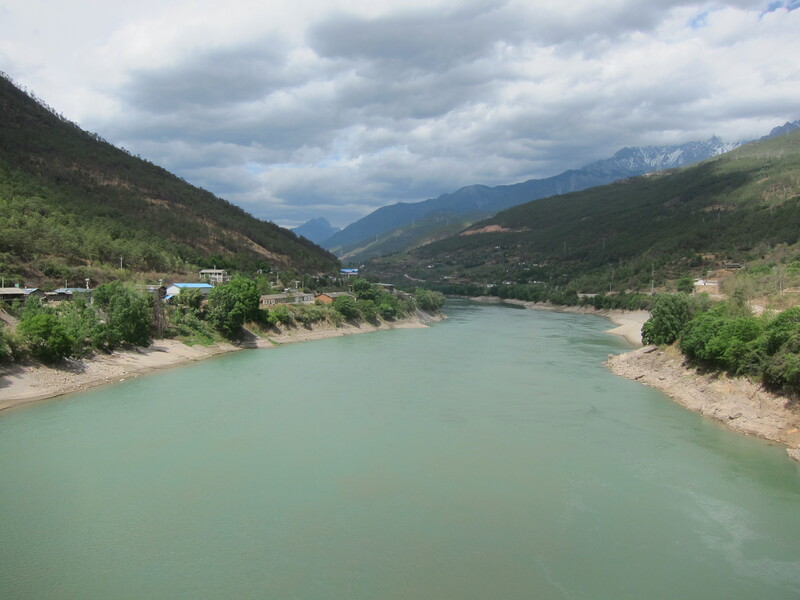 Within the gorge, there are three sections where in each a big rock is blocking the Yangtze river. 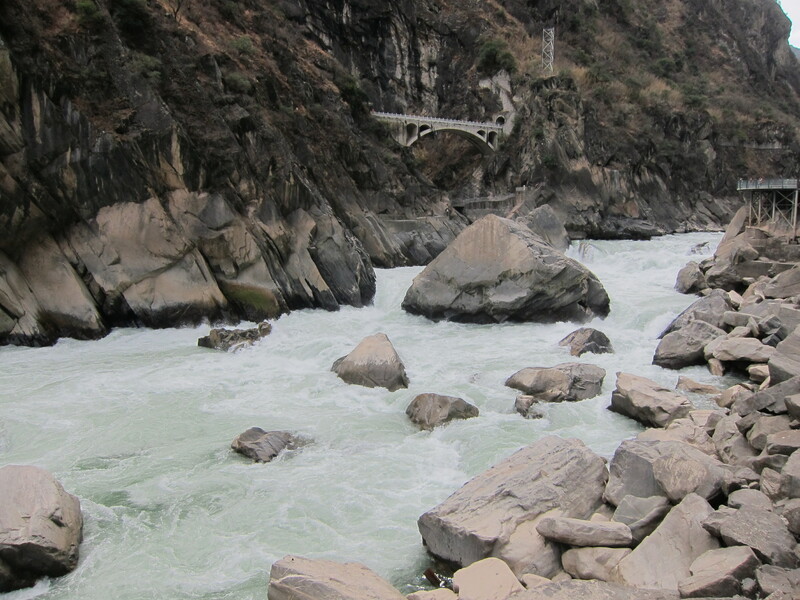 These are where the name of the gorge comes from, as in a legend a tiger used the rocks to leap across the river. We reached the middle of these, from where we were to walk back on the road. 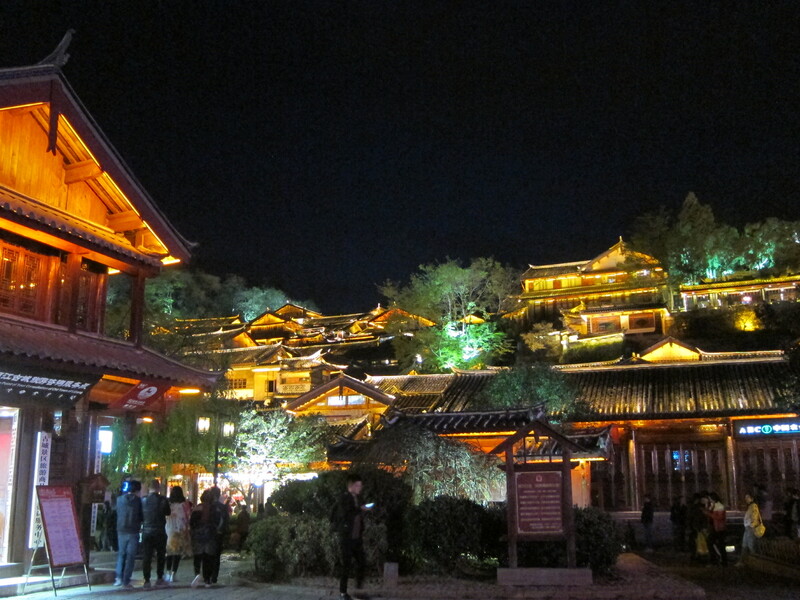 Unfortunately, to see the middle rock one had to pay another fee of RMB15 – we refused on principle. 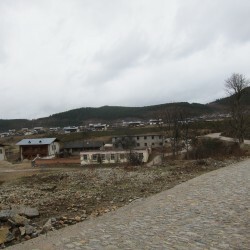 We started walking back up on the highway aiming for the upper rock, closer to our guesthouse, 7 km away. An attempt to hitchhike worked after the 3rd car came past – a nice couple took us to the upper rock, confirming it is free to visit. 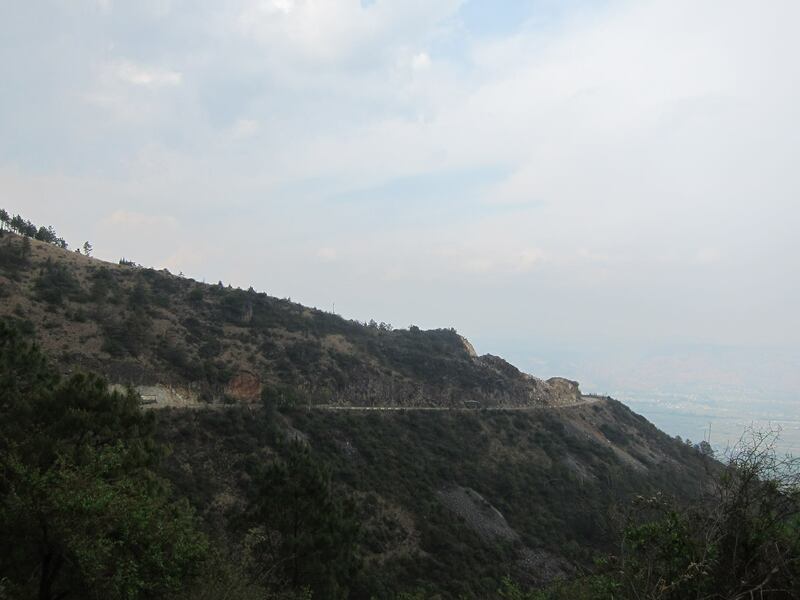 They showed us pictures of the middle one, which wasn’t all that impressive, and explained the reason for the additional payment was because local people maintained the middle rock trail, while the upper one was maintained by the government. 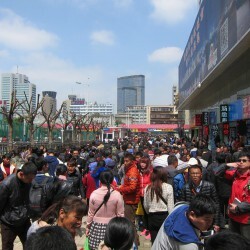 Why were those local people not getting anything of the steep RMB65 entrance fee instead? More questionable wealth distribution that had us wondering. The upper rock was impressive, a huge boulder with water crashing around it. 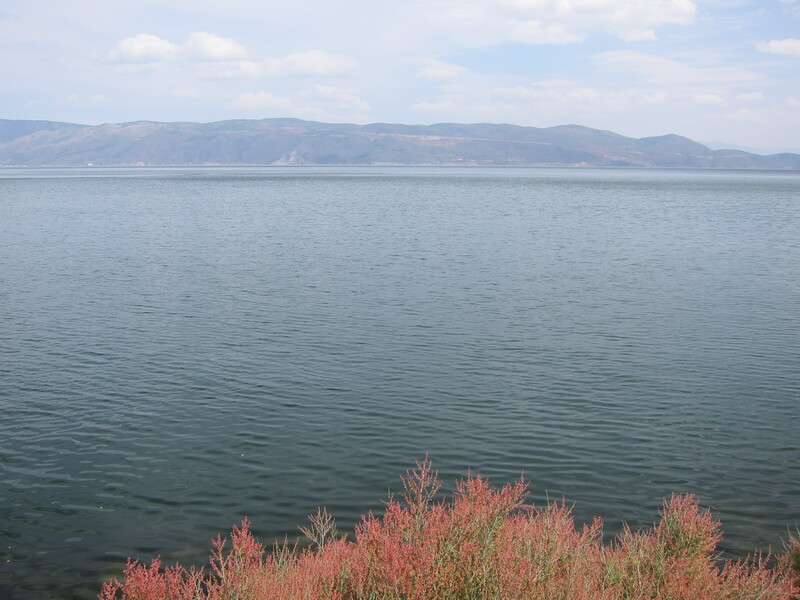 This site was indeed fully developed, with wooden planks and platforms all the way. 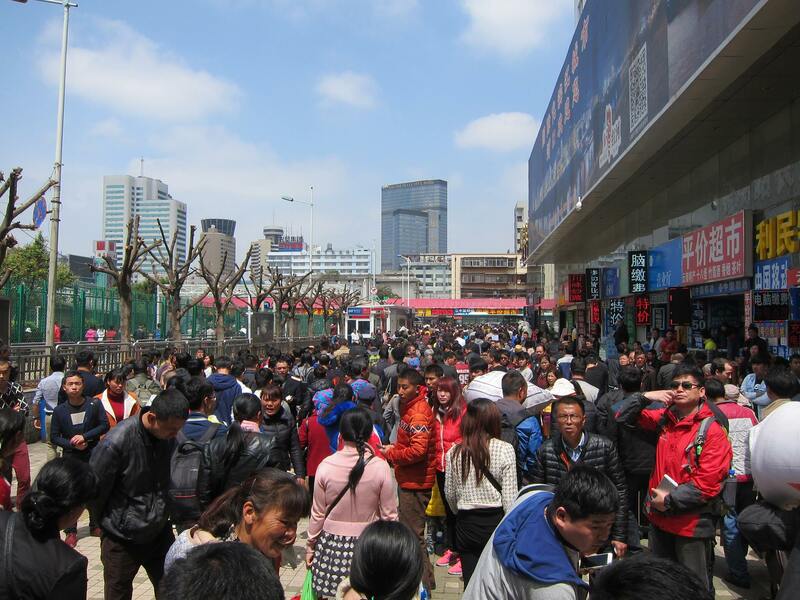 Even here, the average Chinese tourists aversion to hiking was obvious as there were carriers offering to lug one around in a sedan chair for RMB300. 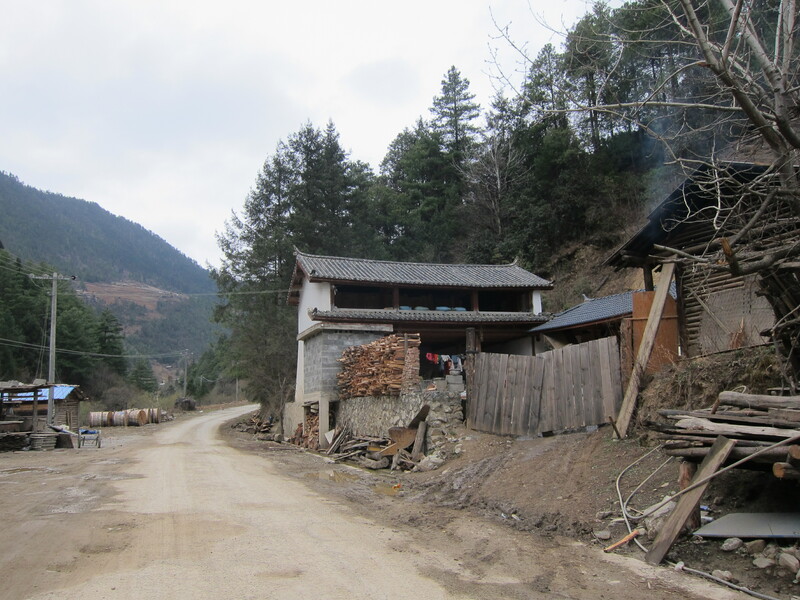 We had a short but steep walk back to the guesthouse when yet another driver offered us a lift up there, this time a farmer. 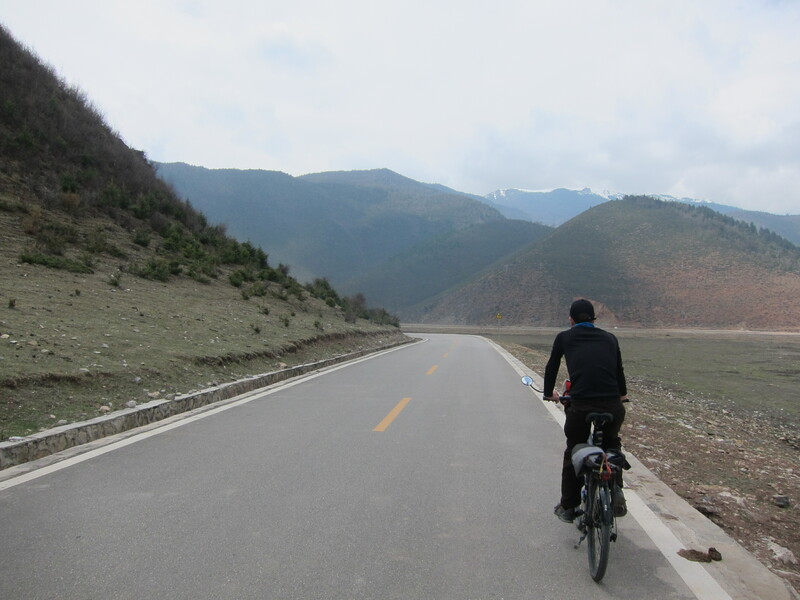 I heard of hitchhiking being hard in China, but in the more remote regions it seemed incredibly easy. 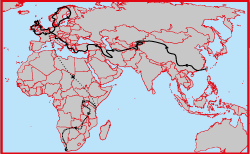 This gave us ideas for crossing the larger distances until my visa runs out. 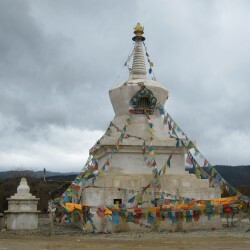 Our next destination of Shangri-La (or Deqen if you’re looking at Google maps) was just about 100 km away, although with a 1200 m difference in altitude. 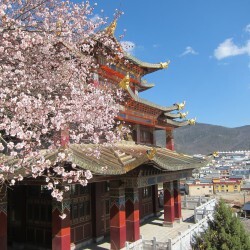 It was imperative that we get there within two days as I needed to extend my visa. But that should be a possible task, right? In fact it seemed easy enough that we took our time getting up and waited out some morning rain. 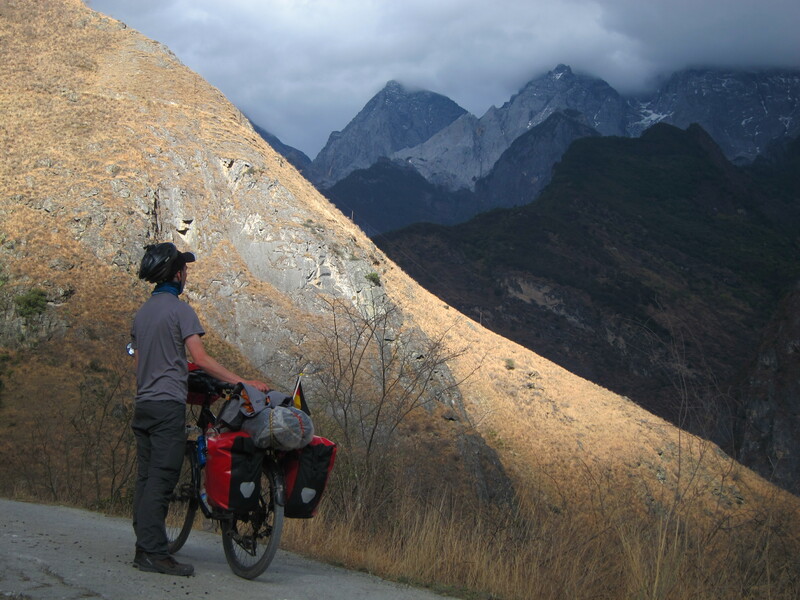 We descended the steep gorge with our brakes begging for mercy – those new pads we bought in Lijiang will have to come on soon. Out of the gorge we started climbing along a river valley with lots of traffic doing dangerous overtakes. Unfortunately Yuily was not feeling well at all so everything went really slow. We still had time to spare to take it easy so we decided to not go much further than 40 km today. After a while the road split. The G214 was reconstructed along a longer route while the old G214 still existed, following a shorter route with much less traffic. 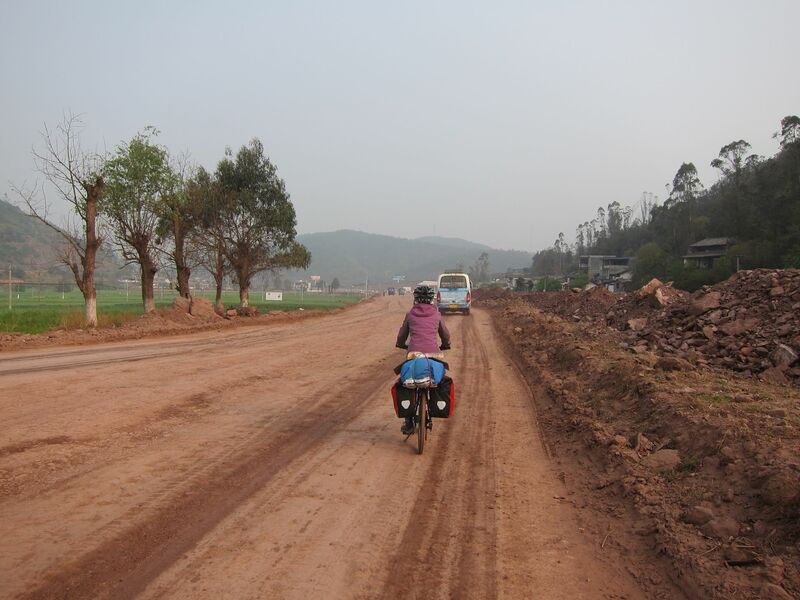 Even though this road was obviously in disrepair on account of the expressway and train line being built along this corridor, we still chose it. 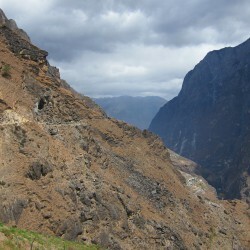 It soon ascended much more steeply than the new road and had us slowed to a crawl. The few cars on this road didn’t bother us much, but it surprised us when some people stopped and informed us on the road conditions and accommodation options. 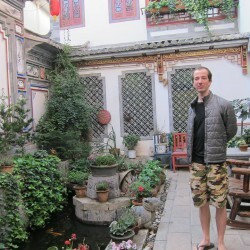 Even though we were fine, the gesture was interesting: This never happened before in China. 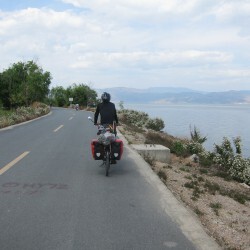 Along with construction workers waving and shouting encouragement, this gave me the courage to try something many cyclists do around the world: Ask to stay with locals. After we passed the 40 km mark, we just entered a courtyard of a local ramshackle house and asked the residents if it is ok to camp there. Of course it was and we were shown a sheltered spot. 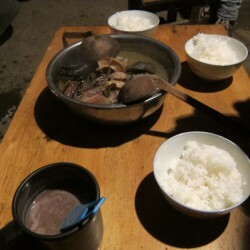 Just as we prepared to cook, they called us over shouting “qi fan” (literally “eat rice”, figuratively “come to eat with us”). 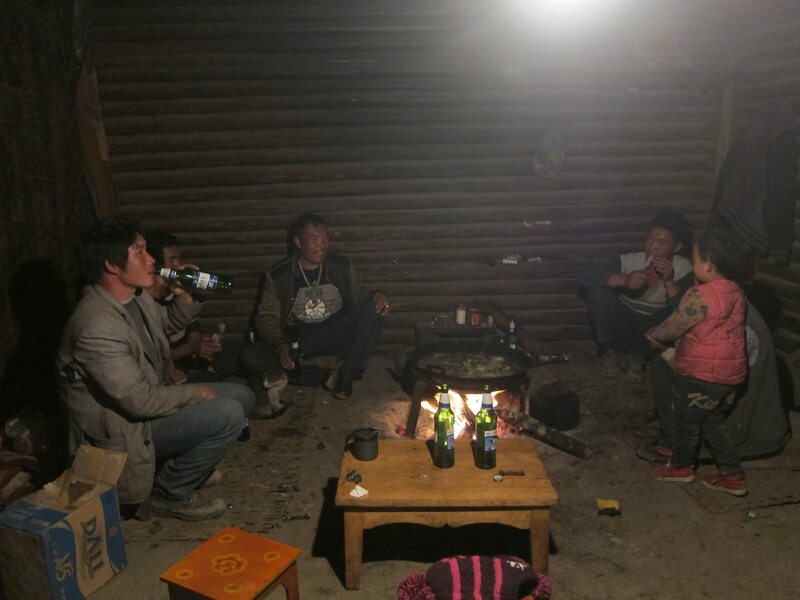 We had a lovely evening among a local family and a few construction workers in a very basic wooden shed with dirt floor and a wood fire, sharing a few beers and lots of talking. One woman was very interested about Taiwan and Yuily happily showed her lots of pictures. 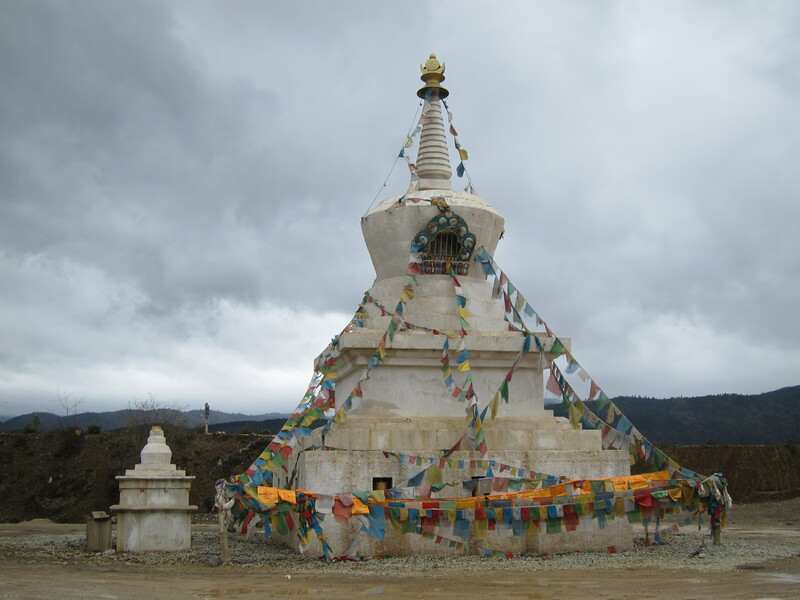 As this area of China was much more remote, people seemed a lot more open and willing to share with strangers – if the time on the Tibetian plateau was going to be more like this, we were looking forward to it. 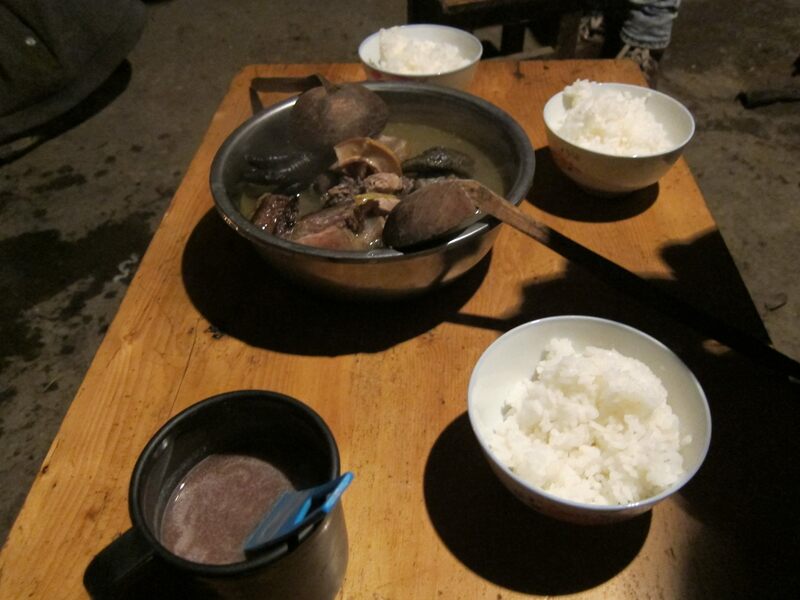 It was raining the next morning and without a chance to refuse we were invited for a noodle soup breakfast. 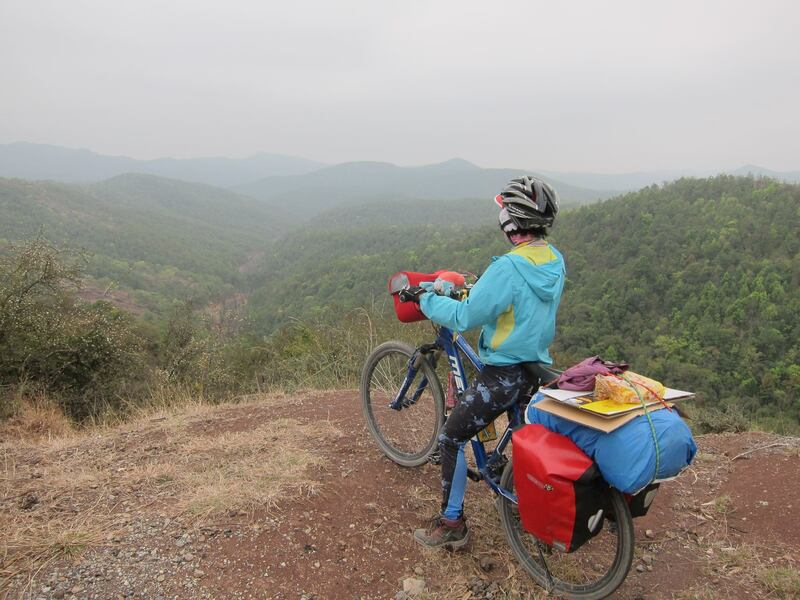 The rain would become a drizzle at best, but my visa pressure, 60 km to go on not good roads uphill got us out there. Our waterproofs came out as the rain increased as we were climbing on crap roads. The past days have actually been quite hot, but we were going above 3000 m, so for the first time in a while it also got quite cold. Not a day to be cycling, but we didn’t have a choice. 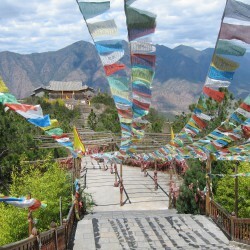 After slowly climbing up a pass we saw prayer flags and a Buddhist pagoda. 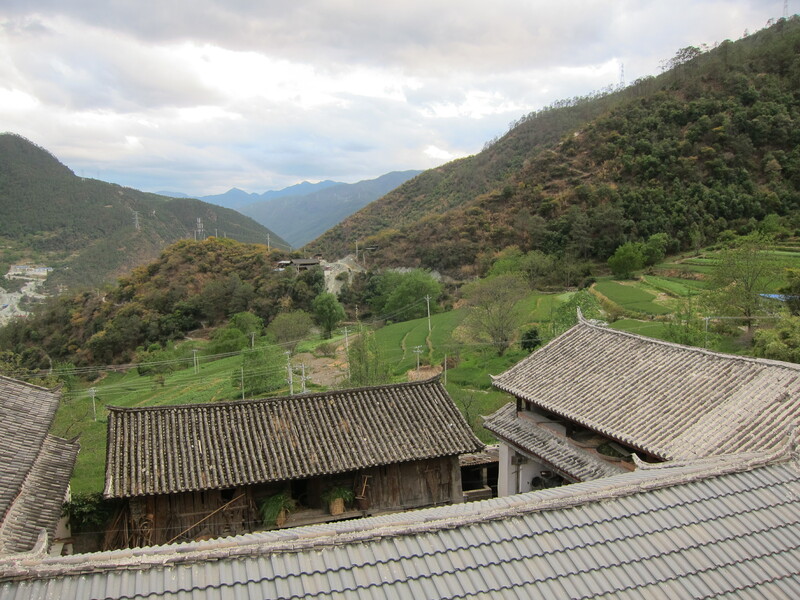 In the land below we saw white, conical houses in a completely different architectural style from anything we’ve seen in China so far. 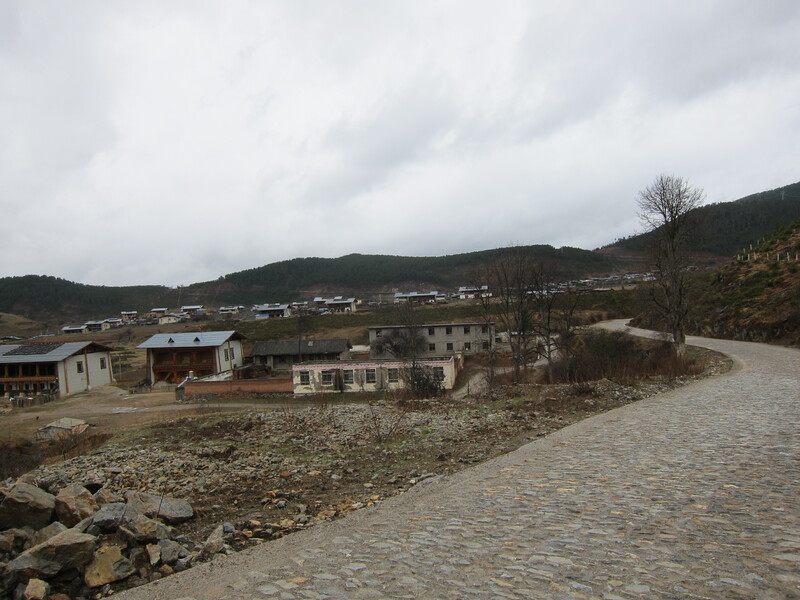 I’ve seen them on TV before and it became obvious, we entered the first Tibetian village of our trip. 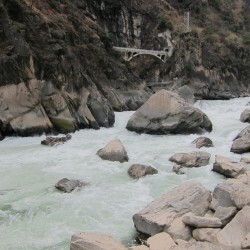 We had an amazing feeling of “Have we come so far?”, soon to be washed away by increasing rain and cold. We opted to stop at a shop to get some food. 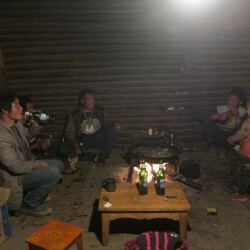 The shop owners saw our cold state and immediately invited us to warm ourselves at their wood stove, served us tea and snacks. 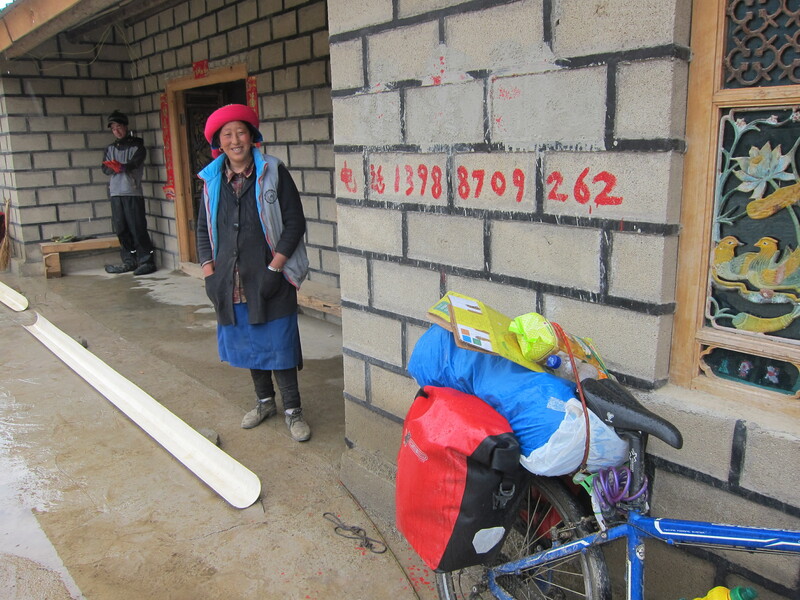 It was a lovely old Tibetian couple and as we heard the rain on the roof becoming more intense, we didn’t mind to spend an hour with them and warm up and dry our clothes. 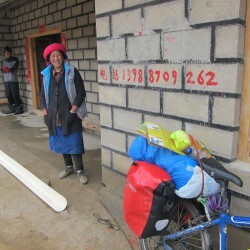 The woman even offered us to stay in her house, but we respectfully declined as we had to get to Shangri-La that day. In a break of rain we got going again thanking her many times. 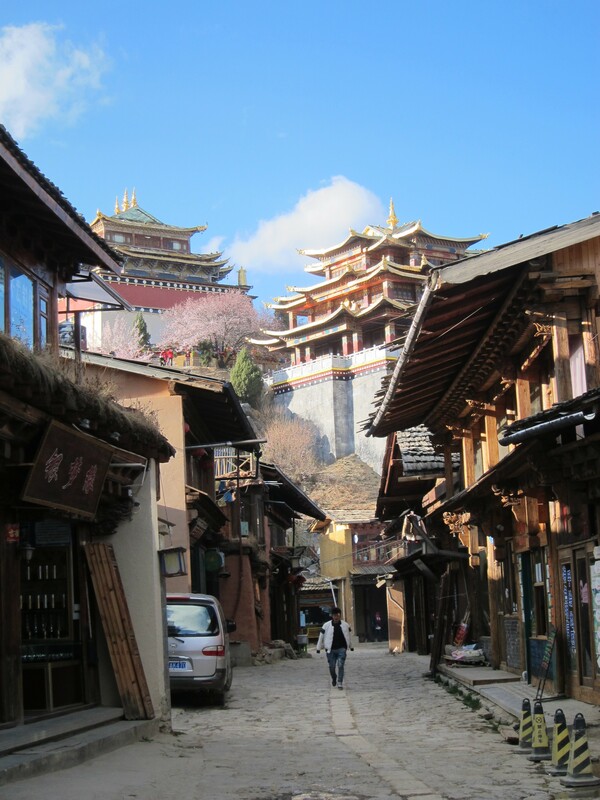 Tibetian hospitality is famous and here we experienced it first hand. We crested another hill and rejoined the new G214 soon. 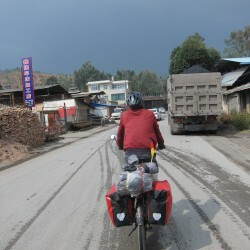 Luckily it flattened out much from here and we made up a lot of kilometers breezing to Shangri-La. But, just 10 km from the goal, I got a puncture. I’ve been riding too much on the shoulder and picked up a piece of glass. Changing the tube was a painful affair in the cold rain but I got it done eventually. 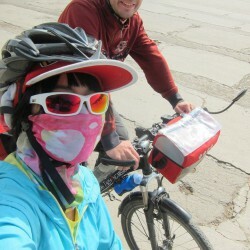 Just as we pushed the bikes back on the road, a pickup truck stopped next to us, the driver shouting a cheerful “Hello”. He obviously saw that we were fine now and kept on driving. I’m quite sure he would’ve offered us a lift if we still had mechanical trouble. 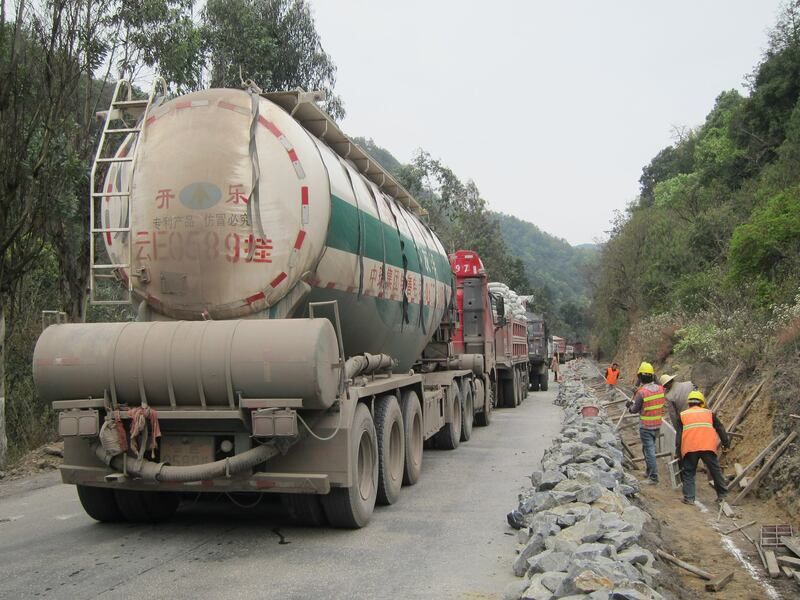 Still a nice gesture, making us even more hopeful for hitching rides for bigger distances across western China. 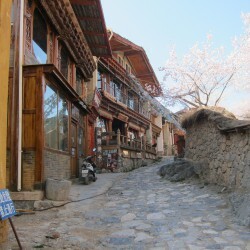 Arriving in Shangri-La, we went to hunt accommodation, which was a little more expensive on average. 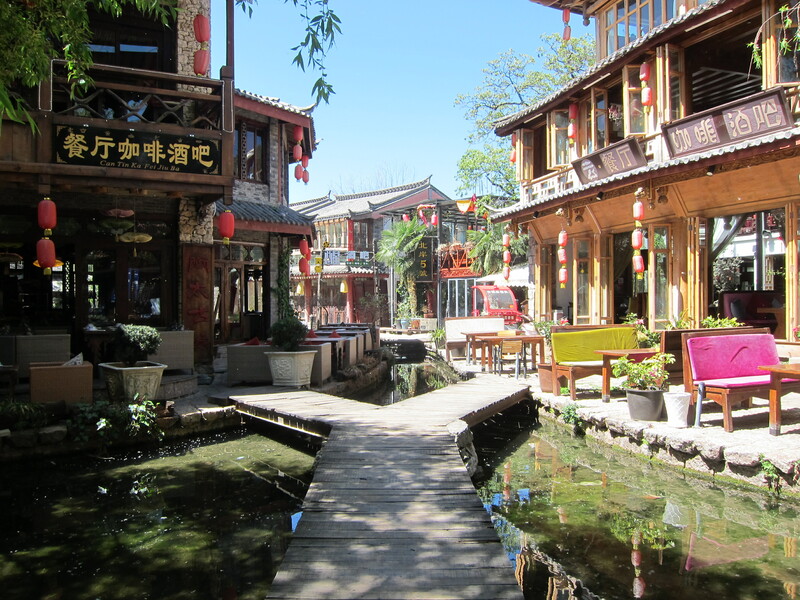 We went through a few hostels and hotels, finding one that would take us for RMB20 per person per night, giving us a discount for staying 5 nights that I needed to wait for my visa extension. The temperatures plummeted in the evening, giving us a winter feeling for the first time – no surprise considering the 3200 m altitude here. 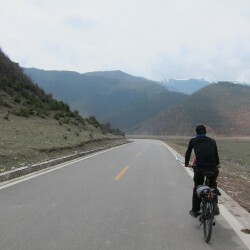 There were other cyclists staying at the same hostel, themselves on their way to Lhasa – a route that would be prevented for us as foreigners require to travel with a tour group in the Tibet Autonomous Region of China, whose border was 200 km further on the G214. My first task in the next morning was to secure a visa extension as it was the last possible day I could extend. I heard it would be easy here and done in just two business days – It being Friday meant that I could expect it on the next Monday. If it failed for some reason, I would have a mad dash to fly anywhere that isn’t mainland China within a day. The first hoop of bureaucracy was to get a resident certificate from the police station. We got directions to the biggest one in town, only to be told there that a smaller station closer to the old town is responsible. I made my way there and got the necessary paper with the help of a note from the hostel. Now I rode across the whole town again to the correct office, inconveniently located 3 km outside of town, that could extend my visa. Yuily took the news well as we were preparing to become residents here for a week, possibly doing trips into the surrounding areas in my waiting time. 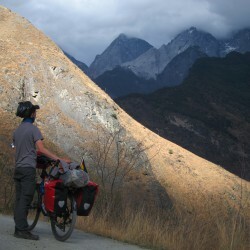 It would at least give us plenty of time to update our blog and work on things and a decent time off the bike to relax. Relax is what we mostly did. The hostel was cheap and the Wi-Fi fast, and the whole time we had an entire en-suite 4 bed dorm to ourselves. It also rained a lot and when it did the temperature never went above 10°C, which is the best stay-inside-weather. 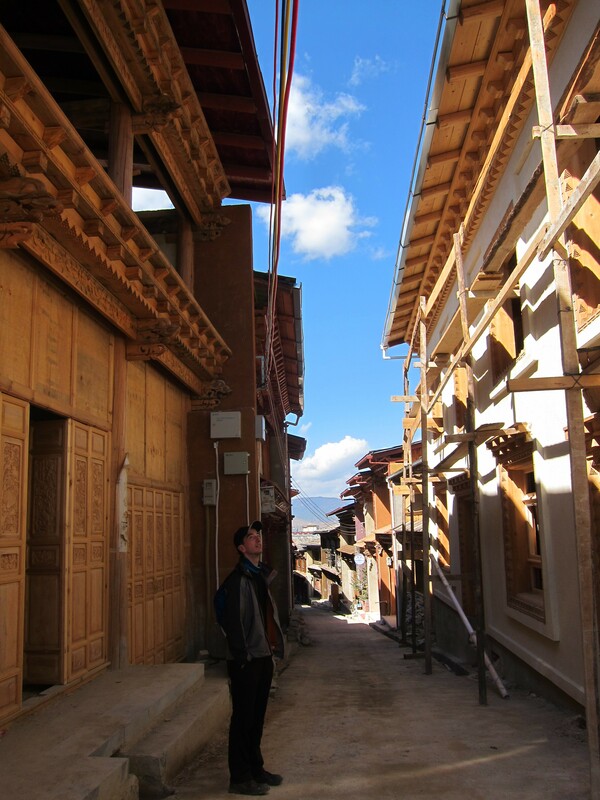 We did manage to see the old town, which burned down in a fire two years before and was still being rebuilt in Tibetian style. 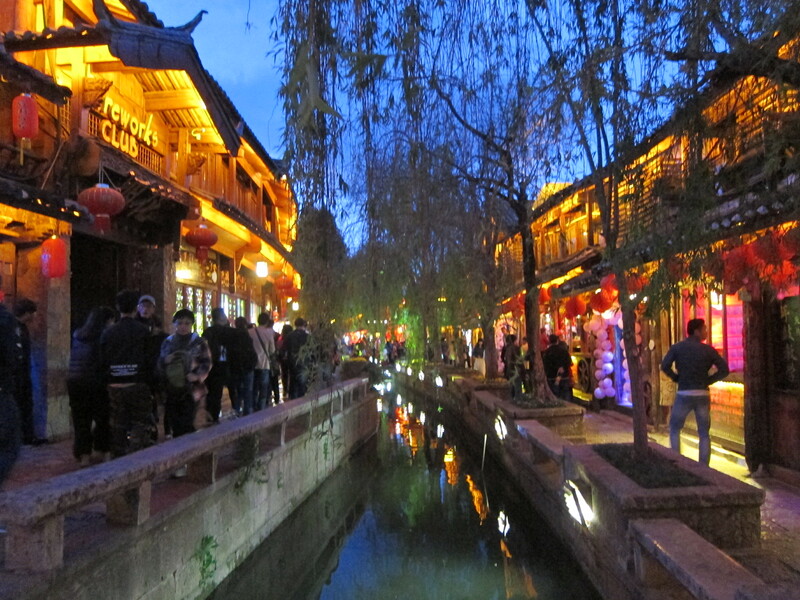 Tourist numbers were down by magnitudes compared to Lijiang and Dali. 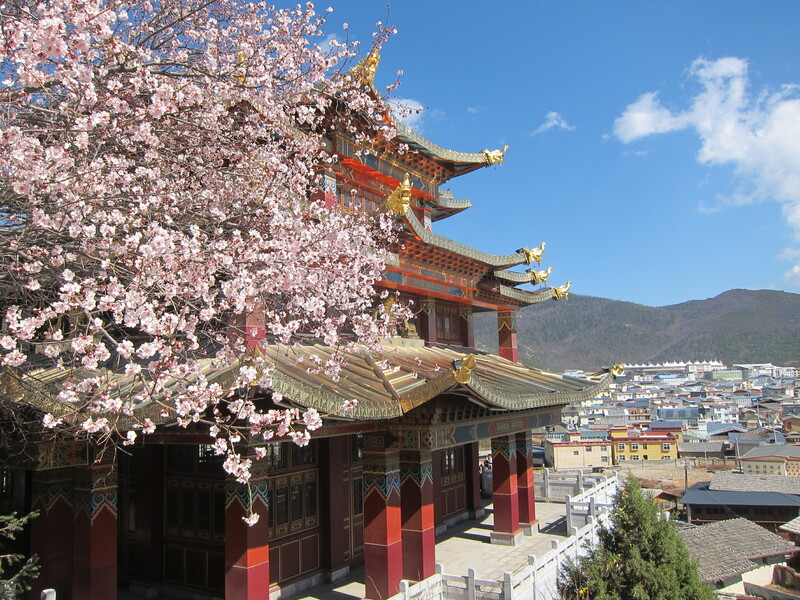 There were cherry blossoms, which made the temple in the middle look extra pretty. 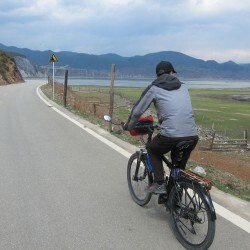 One day trip by bicycle was around the nearby wetlands. 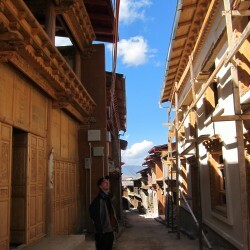 An enjoyable tour on a good road through small farmsteads, where we had our first yak butter tea. Many travelers hate the taste, but not us, we liked it. I also noticed my rear wheel becoming wobbly again. Pouring oil into the hub didn’t do the trick this time, so a nut adjustment was needed. 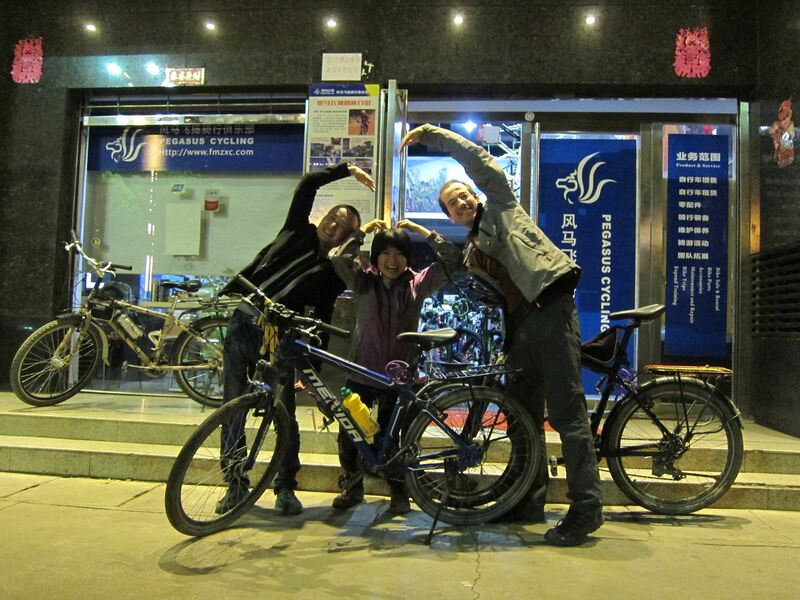 We didn’t have the tools for this, so tried to track down a bicycle shop which did. Unfortunately two we tried didn’t seem the least bit interested in helping, displaying an extremely rude and unprofessional staff behavior. When asking where we could go instead they just pointed in a random direction and said “go there”, just to get rid of us. Luckily we finally found a helpful shop who did the adjustment and only charged us for the parts we bought, no labor cost. We also changed Yuilys chain on that opportunity. I fell sick with food poisoning and a cold, so we postponed our departure by an afternoon. I picked up my extension without issues and we spend an extra night in the hostel. The next morning I woke up to the sound of Yuily vomiting in the bathroom. Despite claiming she is fine, after her third time I knew there was no way we could leave, me not feeling 100% either. So, another day of nursing ourselves and another night in Shangri-La.